Burlap is the latest hot trend in weddings and home decor and we’ve been discovering that burlap is the perfect canvas for embellishing in a wide variety of styles. Featured in this post are some of the drawstring burlap bags that we’ve been playing with here in the studio this month. These are super easy projects that can be completed very quickly with our blank burlap bags and some are even “no sew” projects. We used fabrics and notions that we had lying around and left over from previous projects. So if you like these bags, just take a look around your own crafting space and see what elements you have already that could be applied to a blank burlap bag. 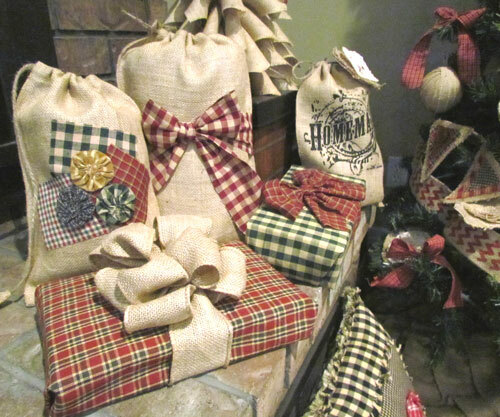 Let your imagination loose and you will surely create your own unique burlap bags for display or for gift giving. Below I’ve included some photos of our bags with a brief comment for each. Click on each bag image to view it up close and see the details. We also have a full tutorial for creating a personalized monogram gift bag which is a bit more complicated than the others but SO worth the effort! So browse our bags and be inspired! This bag is SO easy! 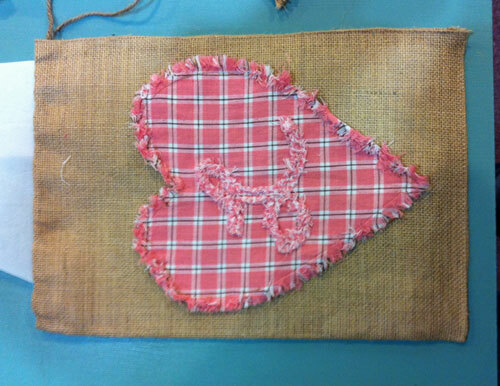 All you need is our small 8″ x 12″ blank burlap bag, some fabric scraps and a glue gun. Put a piece of scrap paper inside the bag so that the glue won’t leak through to the back side. Cut three different size squares from three different fabrics and arrange them on the bag in a random design. Glue into place. Make three fabric yoyos using different fabrics or use our premade homespun fabric yoyos as I did in this example. If you don’t know how to make a yoyo, here’s a great tutorial I found online. Glue your yoyos into place and you’re done! You could also add bits of lace or buttons or many other sewing elements to this design. 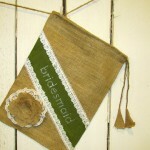 Many brides today are using burlap in their wedding decor. This adorable bridesmaid design serves as an adorable gift bag and a keepsake for the attendants as well. The iron-on rhinestone transfer is available from Jubilee Rhinestones. 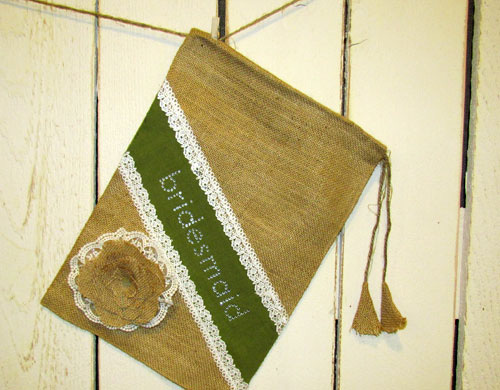 The “bridesmaid” word was iron onto a strip of solid fabric and then glued to the burlap bag. Be sure to insert some paper into the bag first so that the glue won’t leak through to the back side. Trim the side edges evenly and add some lace to cover the long edges. We glued some ruffled 2″ lace to the back of one of our burlap flowers and then glued the flower to the bag. Ta da! The perfect combo of bling, lace and burlap! This design was constructed similar to the bridesmaid design. We used a thinner fabric strip and put some homespun fabric with raw torn edges behind the burlap flower this time. The iron on rhinestone letters that spell “LOVE” are available at Jubilee Rhinestones. Of course, that could be customized to your preference and you could spell a name or Happy Birthday or whatever was appropriate. 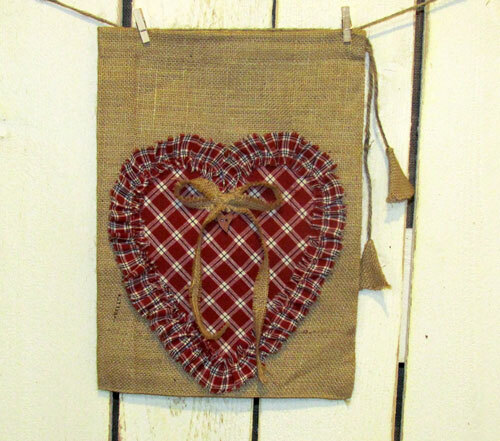 This little heart design would make a perfect bag for Valentine’s Day or it could be used as decor in a country style theme. 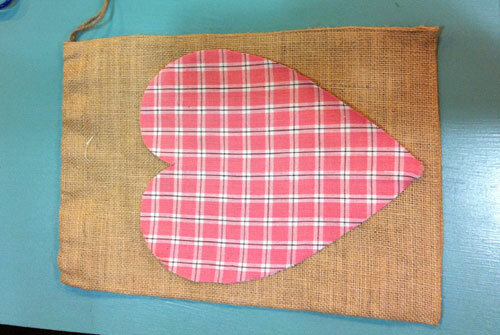 We cut out a heart design on the diagonal using our Red Delicious 6 homespun fabric and glued that to the burlap bag. Insert paper into the bag before gluing so that the glue won’t leak through to the back side. 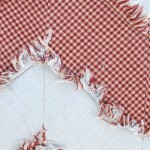 Then we made a 1″ ruffle with raw torn edges from our Red Delicious 5 homespun fabric. 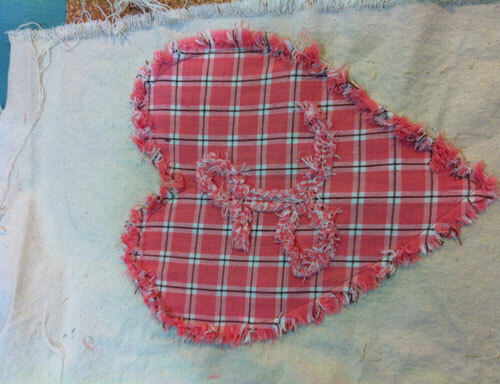 We glued the ruffle to the bag, covering the raw edges of the heart and starting/ending at the top of the heart. 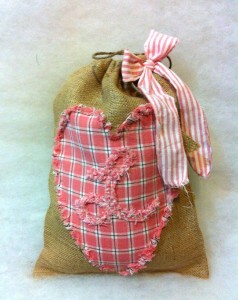 We finished this off with a skinny burlap strip tied into a bow and one of our heart shaped wood buttons. 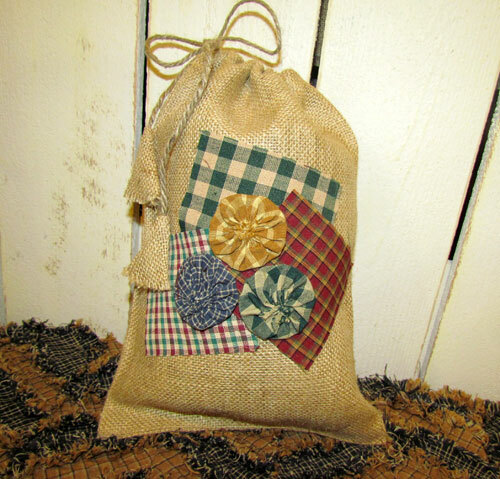 If you ever make rag style throws as gifts, you will LOVE this bag idea! I recently made this chevron style throw for a friend and I simply used my leftover quilt pieces to embellish a matching gift bag. I used the large size burlap bag and the throw fit perfectly inside. A matching gift bag really made the entire gift presentation unique and crafty. To create the frayed edges on the bag embellishment, I first stitched the pieces together, then stitched them very loosely on a piece of heavy canvas fabric. Then I clipped the edges just like I did for the rag style throw and washed it in a washing machine to create the “fray”. 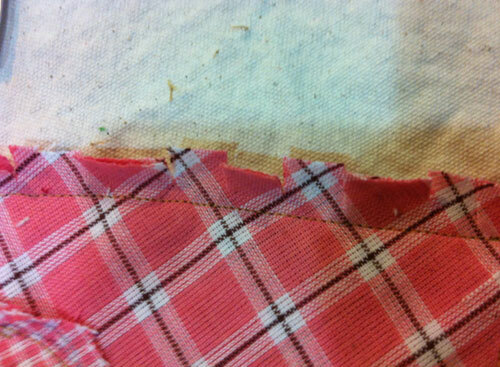 After drying, I used a seam ripper to separate the frayed fabric from the cotton canvas. 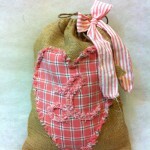 Then I glued the frayed fabric onto the burlap bag. Be sure to place a piece of paper inside the bag first so that the glue doesn’t lead through to the back. This project only works with homespun fabric. Regular cottons just do not fray as well. How easy is this??!! 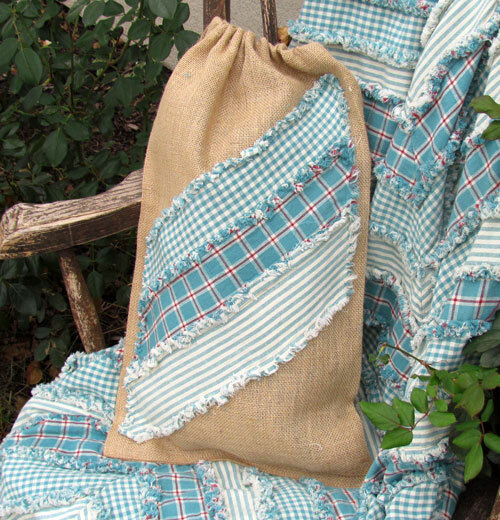 Just tear a strip of homespun fabric about 2.5 inches wide and tie it around the filled bag. I did that this year for several Christmas gifts and the recipients were almost as excited about the bag as they were the gifts! If you don’t have any homespun on hand to tear into strips, we have some pre-cut 2.5 inch homespun in a few color options. 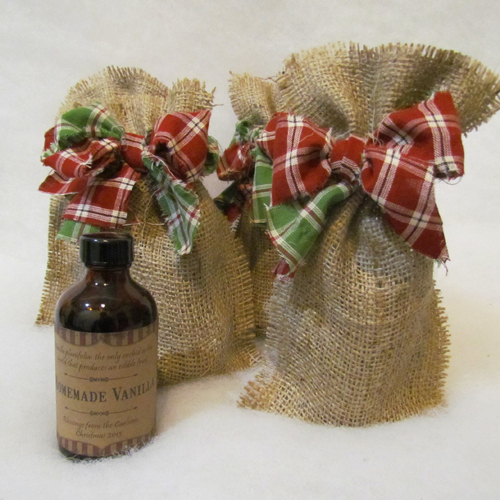 This year for Christmas, I also made my own “homemade vanilla” as office gifts for my husband to give to his co-workers. 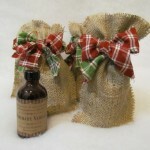 Everyone was so pleased to receive their vanilla bottle bagged in this fun and easy burlap project. 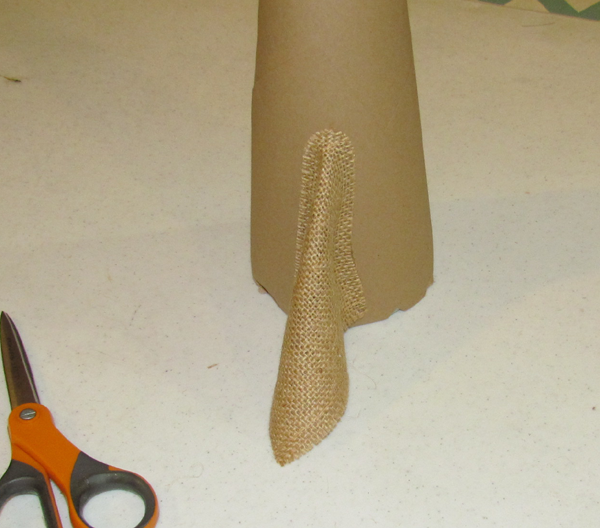 I used our 5″ wide burlap and cut it in strips that were 4 times longer than the height of the bottle. I folded it in half and stitched the long sides with a tight stitch. Then I dropped the bottle inside and tied it with two torn homespun fabric bows in Christmas colors. The results were SO cute that I’m planning another set done in everyday colors to use as hostess gifts and such. This precious bag was done for a recent baby shower gift. Needless to say, there were plenty of oohs and aahs over the bag as well as the gift inside. In this case, I didn’t have time to make something handmade for the baby but the gift was still personal due to the handmade bag. If you are interested in trying one of these, we have a full tutorial about how to make this personalized burlap gift bag. We all know that presentation is sometimes almost as important as the gift it’s self and with just a little effort, you can create this amazing personalized burlap and homespun gift bag. 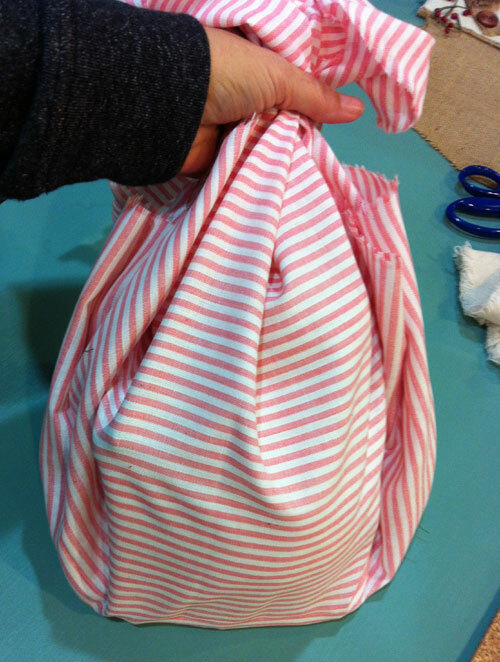 The bag pictured here was for a baby shower for a new baby named Lucy. Thus I chose to use the Petal Pink homespun fabrics in this embellishment. Following is a brief tutorial outlining how we created this particular gift bag. These basic methods can easily be altered to fit your situation or needs. I hope you enjoy seeing this bag come together and I hope you are inspired to create your own unique creation! *Only homespun fabric is recommended. Regular cottons just do not fray as well. 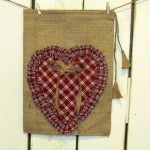 From a piece of scrap paper, cut out a heart shape that fits nicely onto the burlap bag you are using. Remember when you are sizing it that there will be about 1 inch of ruffled added to the edges. 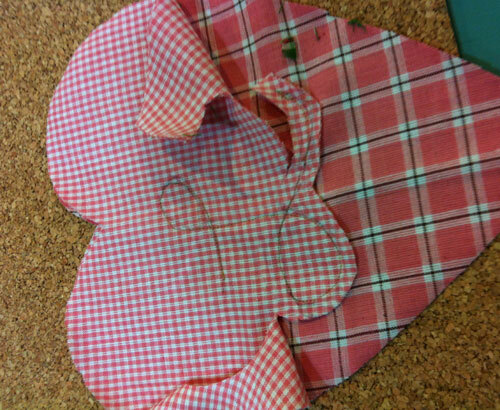 Use this paper heart as a pattern to cut out two fabric hearts: one from the fabric that you want to use for the heart background and one from the fabric that you want to use for the monogram letter. 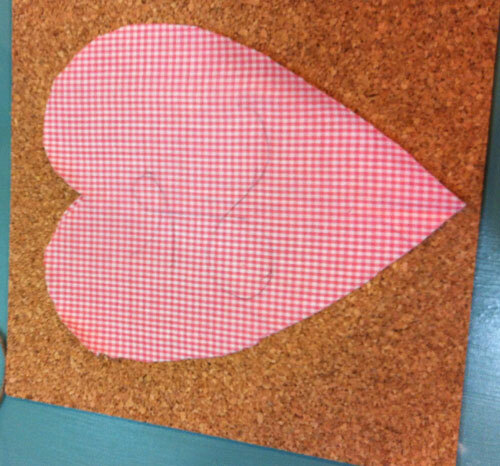 Draw your letter on the second heart using a light color pen or washable pen. Center it on the heart the way you want it centered on the bag. If you make a mistake, just redraw. The ink lines will disappear when we are done if you are using a light color. Place this heart over the top of the background heart and match up all the edges. Pin in place. 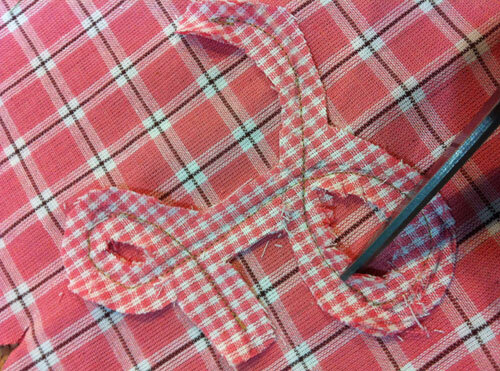 Now stitch a single line of small tight stitching following the lines of the letter. 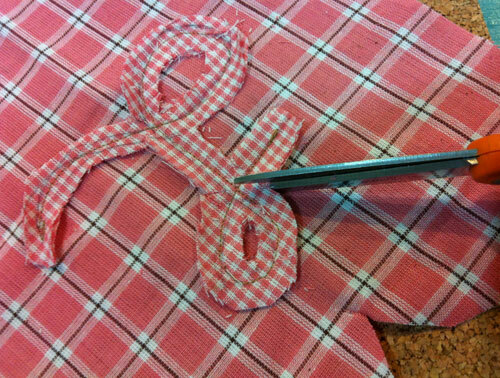 Be sure to backstitch well at the beginning and the end to tie it down good. 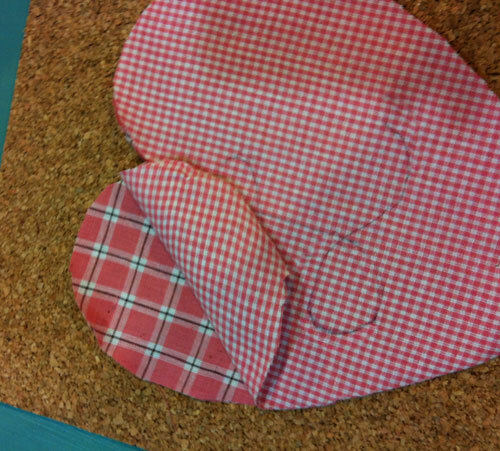 Cut away all the excess fabric of the top heart leaving about 1/4 t0 1/2 inch of fabric around the stitching lines. Be very careful that you don’t cut or clip the background heart below. 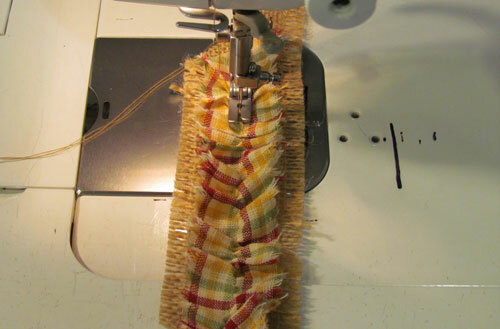 Use a seam ripper to open any “loops” so that you can cut out the fabric inside the loop. 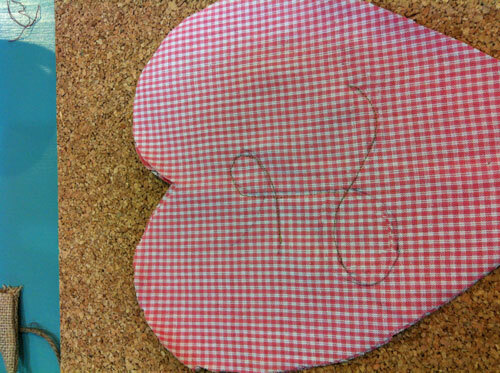 Make small “clips” into the remaining fabric of the upper layer being very careful not to clip into the stitching or the background heart below. Clips should be about 1/4 inch apart. Clip diagonally into any corners. 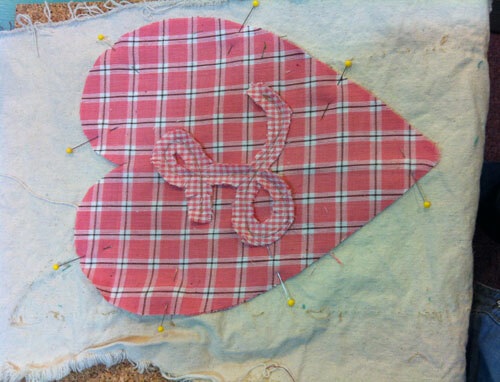 Place the heart onto your heavy cotton canvas on denim piece and pin in place. 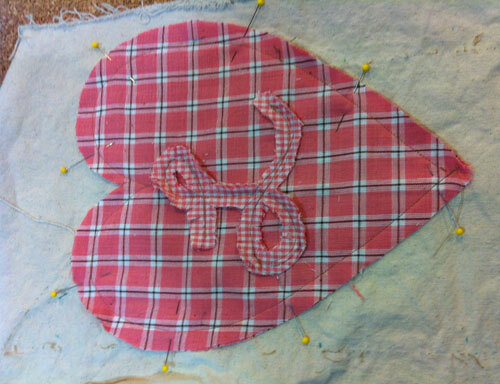 Stitch around the perimeter of the heart with a long stitch about 5/8 inches from the raw edge. You don’t want this stitching to be tight because you will be removing it later. Clip the exposed seam allowance around the edges of the heart being careful not to clip into the stitching. Clips should be about 1/2 inch apart and about 1/2 deep. Clip diagonally at the “v” at the top and the bottom of the heart. Machine wash the heart and canvas and tumble dry. This will cause all those “clips” to become a lovely “fray”. 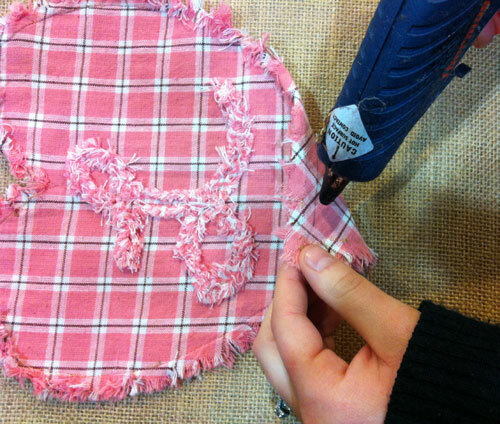 After it’s dry, remove the heart from the canvas very carefully with a seam ripper. 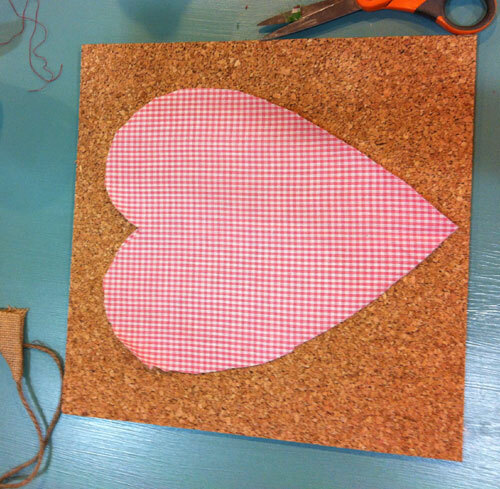 Press the heart gently from the back side if needed and place it on your burlap bag. Once you have it aligned the way you want, glue it into place. Put some scrap paper into the bag so that the glue won’t leak through to the back side. Embellish with a fabric bow or jute bow. … or make it your own with your own creative embellishment ideas! Now you need to find that extra 1/2 to 1 yard of fabric for “wrapping” your gift. Loosely wrap the chosen gift in the fabric and place the entire bundle inside the bag. There you have it! An adorable little personalized gift bag that will sure to be kept and treasured for years! Are you going to make one of these? We’d love to see pictures! With projects like this, everyone puts their own creative spin on it and it’s so fun to share and be inspired. 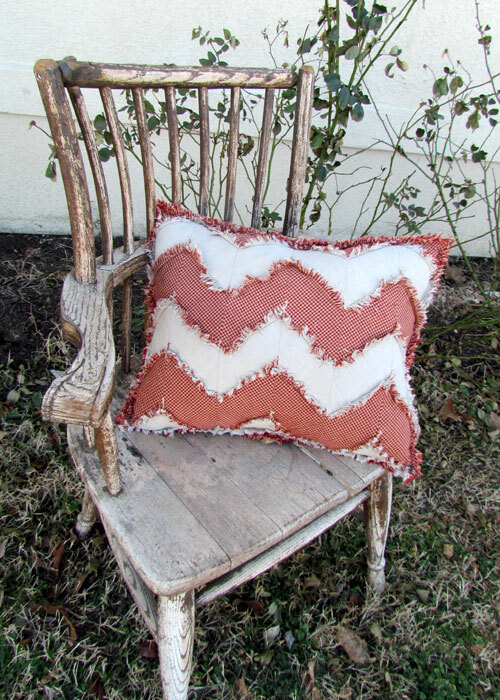 If you love chevron design and you love the shabby rag style, you will definitely want to check out this Super Easy Shabby Chevron Pillow pattern! Featured below are all the instructions and tons of pictures to help you create this fun accent pillow. Sewing skills required are minimal and it should only take you 2-3 hours to complete. This is a perfect quick project for these long winter evenings. I chose Warm Red 2 & Ecru homespun to do my chevron design but this design works well with any combination of homespun fabrics. You may want to use contrasting fabrics like I did for a bold look or this would look really nice in complementary similar fabrics for a more subtle chevron look. 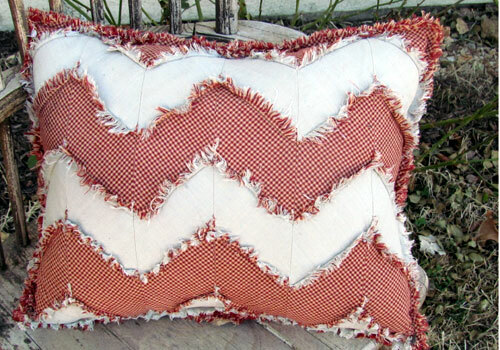 In either case, Jubilee Fabric has a great assortment of over 150 different primitive homespun fabrics for you to choose from for you own unique pillow design. What makes this pattern “super easy” is that there are no small pieces to cut out and no small pieces to stitch together. 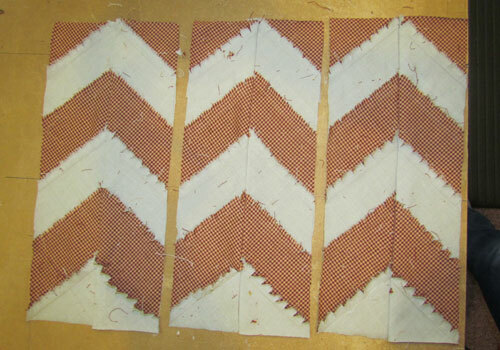 This chevron design is first stitched together in long strips and then cut on the diagonal to form the chevron. That will greatly speed up the time that you invest to this project. The finished size of this pillow is approximately 18″ x 21″. It is important to use homespun fabric because regular cotton fabric will just not fray as well. Happy stitching! … and if you make one of these, send us a pic! 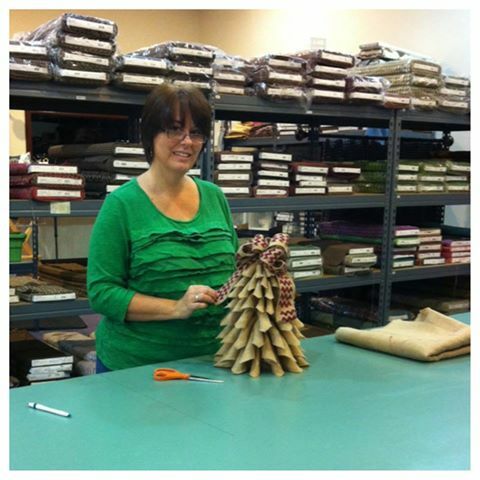 We love to see what our customers are making! 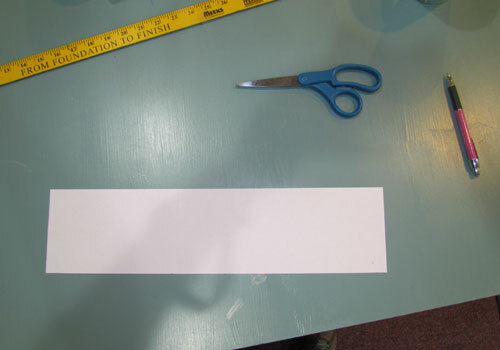 thread, 2 sheets of blank copy paper & a yard stick or ruler. From Fabric 1 cut 6 strips of fabric from selvage to selvage. Each strip should measure 4″ wide and approximately 43″-44″ long. From Fabric 2 cut 5 strips of fabric from selvage to selvage. Each strip should measure 4″ wide and approximately 43″-44″ long. 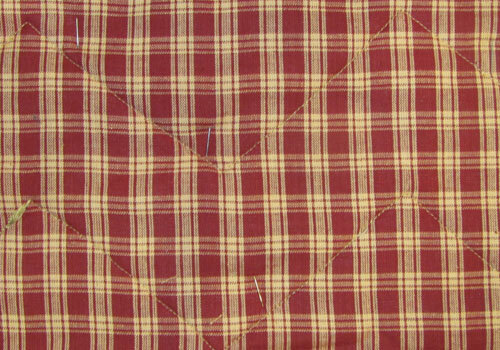 From the Fabric 3 fat quarters, cut three pieces 18″ x 22″. Always backstitch each seam to secure it but do the backstitch about 5/8″ from the beginning. 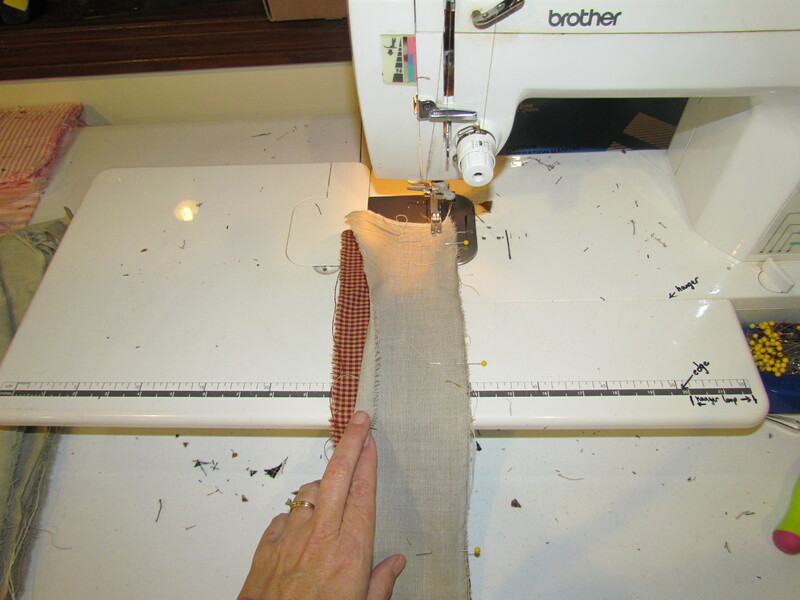 That first 5/8″ of most seams will become “fray” and will not hold the backstitch. 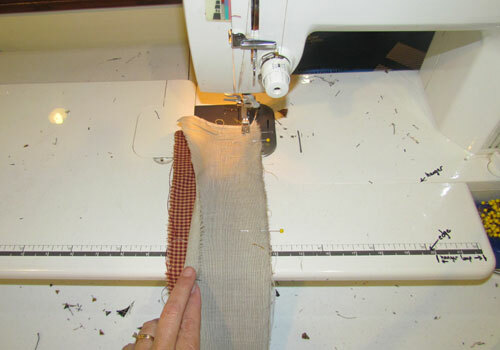 Stitch the strips of fabric 1 and fabric 2 together with a 5/8″ seam, starting with fabric 1 and alternating with fabric 2. Clip all the raw edges of the seams (you don’t need to clip the outer perimeter edges) about 1/2 inch apart and about 1/2 inch deep. It doesn’t matter at all if the ends come out even or not because they will be cut away eventually. Make sure you don’t clip into the stitch line. If you do, restitch it immediately and seal it with something to prevent fraying like No Fray liquid. 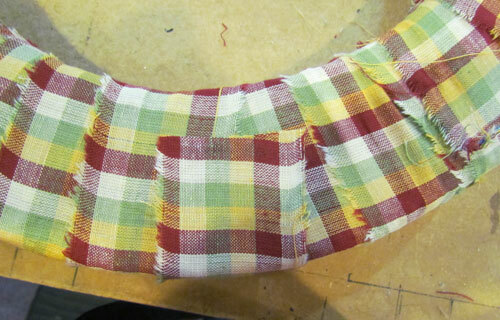 When all the strips are stitched together and clipped, press the raw seams all toward the same direction. Press from the other side also to make sure your seams are flattened. Carefully tape your two copy paper pieces together matching up the short sides. 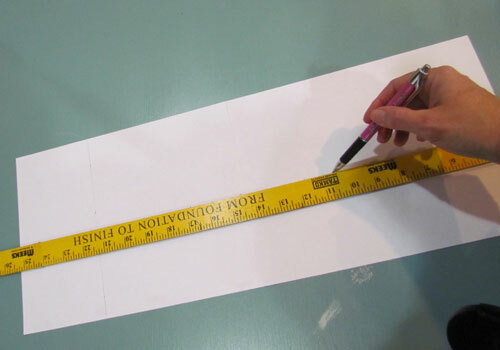 Then along one side use your ruler or yard stick to trace off a segment measuring 4.5″ x 18″. Cut this out. It will be your pattern piece for the chevron design. 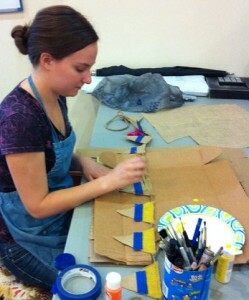 Fold your striped block in half lengthwise with the clipped sides out. 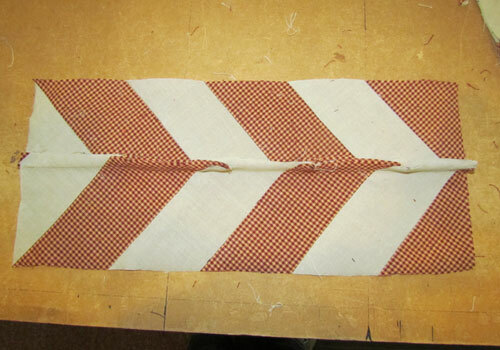 Match up the seams on the unfolded edge so that the stripes are exactly identical on the front and the back. Put some pins randomly throughout to hold it into place. Place the pattern piece on the striped block at a diagonal. 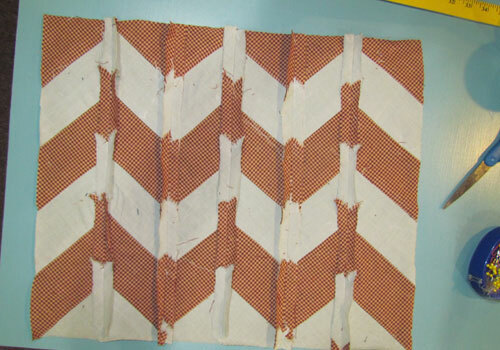 Put the lower left corner of the pattern piece exactly touching the stitched seam in the lower left corner of the striped block as shown in the pictures below. Place the upper right corner exactly touching the stitched seam four rows across. Study the pictures if this sounds confusing. Now trace this piece and repeat the process two more times, placing the pattern piece on your striped block so that each cut out has the same striping pattern. Place some pins inside the traced cutouts so the upper or lower fabric won’t shift. Then cut out all three pieces, cutting through both layers. See images below of the finished cut outs. Unpin the first cutout and re-pin it just as it was but with the clipped edges on the inside this time. Try to match up the seams carefully. (These seams will be the v’s of your chevron design.) Stitch along the right side with fabric 2 at the top and fabric 1 at the bottom. Do this with all three cutouts and open them as shown below. Line up the three rectangle pieces as shown in the picture below. The pattern should be exactly the same in all of them. Stitch the three pieces together in the same pattern as they are shown above. Stitch them together with the clipped edges on the inside. Press the long seams flat. This side shown below is the BACK side of your pillow block. The front side has the clipped edges. 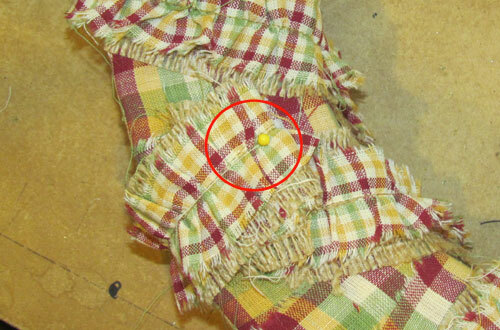 Place one of the batting/felt pieces into the center of one of the fabric 3 pieces. Trim batting/felt if necessary to make it approximately 1″ from the edge on all sides. If it’s more than 1″ in places, don’t worry about it. 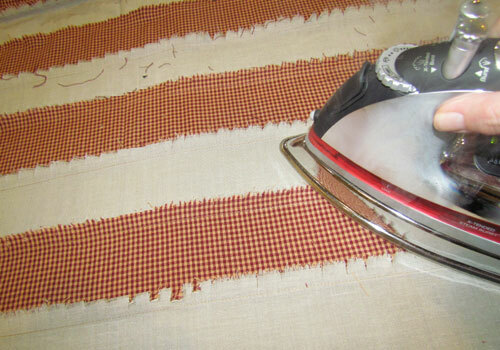 If you have the quilt basting spray, spray both sides of the batting lightly to help hold it in place while stitching. Place the stitched chevron block on top to create a sort of “sandwich” with the batting/felt in the middle. Make sure the clipped edges of the chevron piece are facing out. Pin on all sides and randomly across all the stitch lines. Create a similar “sandwich” with the two remaining fabric 3 pieces and the one remaining batting/felt piece. Use the quilt basting spray again on the batting (optional). Trim the batting/felt as needed and pin all three layers together. 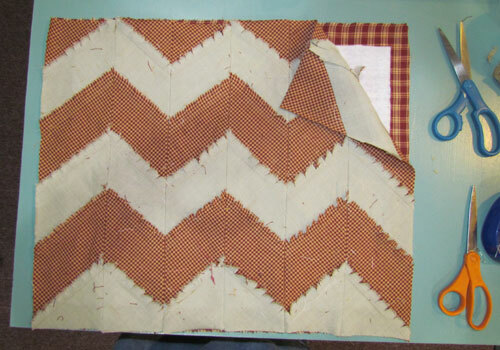 From the front side of the chevron “sandwich”, stitch a quilting stitch through all three layers following the stitch line of the seams. This will create a chevron quilt pattern on the back side. 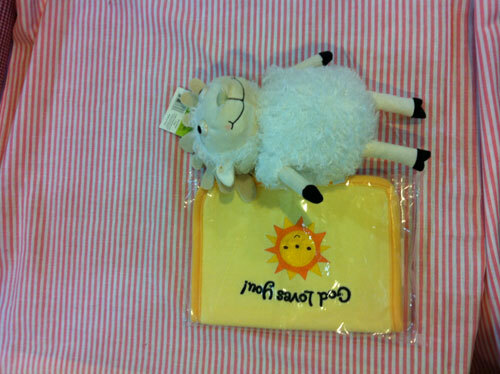 Which unfortunately, will be hidden inside the pillow but because it’s pretty, I’m adding a pic of the backside also. Stitch a line across the center of the bottom edge about 6″ wide and 5/8″ from the edge. This will secure the layers when you are stuffing the pillow later on. 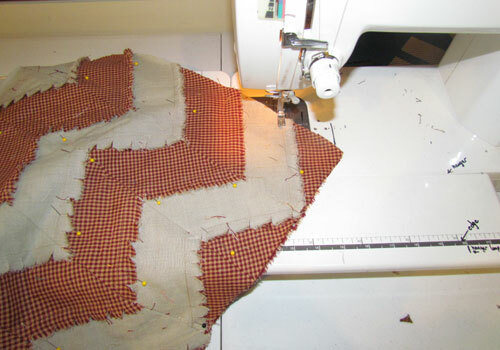 Stitch the other “sandwich” together by adding some quilting lines. You can do this however you wish just as long as you stitch the three layers together. You can follow the design of the fabric or draw some lines to stitch on with a pen that will wash out. Be creative! It doesn’t need a lot of stitching; just enough to hold the batting in place when it’s washed. Stitch a 6″ span in the center of the bottom of the panel that matches up with the 6″ span at the bottom of the front panel. Place the second sandwich flat on the table and place the first one over it with the clipped edges facing out and matching up the 6″ spans as best you can. They don’t need to match exactly. Pin in place. 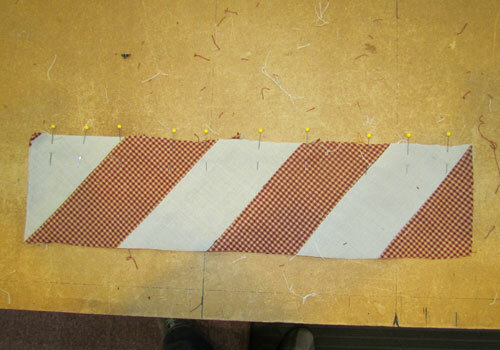 Stitch around the perimeter about 1″ from the edge beginning with one end of the 6″ span and ending with the other end. This will leave a hole in the pillow where you can stuff it later on. 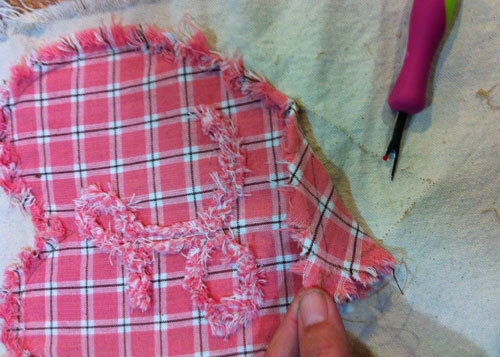 Clip the outer raw edges of the pillow. On the corners, make a diagonal clip as shown below. Be very careful not to cut into the stitching line while making your clips. Wash your pillow before stuffing it. Machine wash in cold and tumble dry. Use a liquid fabric softener if possible to help loosen the threads for the “fray”. Between washing and drying, take the pillow outside and shake it to remove a lot of the strings. Also, you’ll probably want to stop the dryer at least once and clean the lint trap of strings. After it’s dry, stuff the pillow through the opening at the bottom with some fiber-fill of your choice. Then machine stitch or hand stitch the opening closed and enjoy your Shabby Chevron Pillow! When do you decorate your Christmas tree? Thanksgiving weekend? Christmas Eve? Early in December? Most families have some sort of tradition associated with decorating the Christmas tree in their home. When our kids were younger, we would decorate the tree on Thanksgiving evening and we always bought a family movie to watch during the activity. We enjoy change in our family so some years the tree decor would bust out in some new color or theme. This year we decorated a bit early because of the late Thanksgiving schedule and we did a burlap and homespun inspired tree! Oh the creative possibilities with THAT! So… I cordially invite you to “tour our tree” through the images below and see all the fun burlap and homespun fabric decorations. Once you get started thinking along this line, the ideas start flowing. 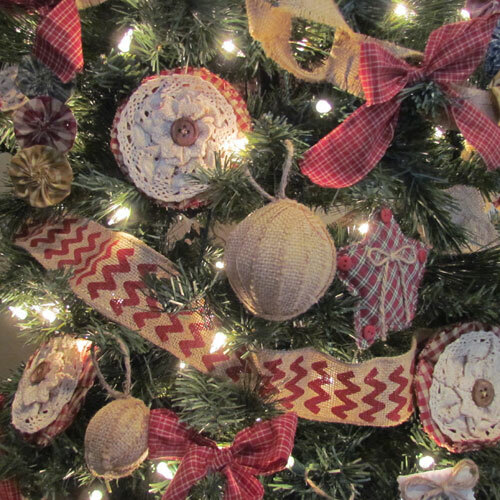 I bet these pictures will spark some creative ideas of your own and if they do, please leave us a comment telling us what YOU would do with burlap and/or homespun on a Christmas tree. Sitting on top is a bow made from two rolls of the 2″ Red Chevron Wired Edge Burlap Ribbon. 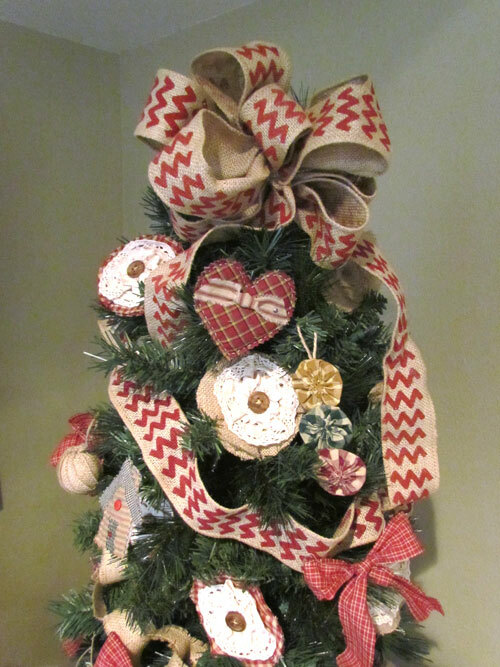 The we wrapped some more of the Red Chevron Burlap Ribbon around the tree as a garland. For this particular tree, I think we used about 5 more rolls. We made fabric “gumdrop” ornaments using three homespun yoyos glued together and some jute string. We whipped up a good old fashion “chain” garland using our 1″ Frayed Edge Burlap Ribbon and a glue gun. The ribbon was cut into 6.5 inch strips and then just looped together and glued to form a chain. Each roll of 1″ ribbon would give us about 30″ – 33″ of chain garland. This would be a really fun Christmas craft project for kids if you used Elmers glue instead of hot glue. 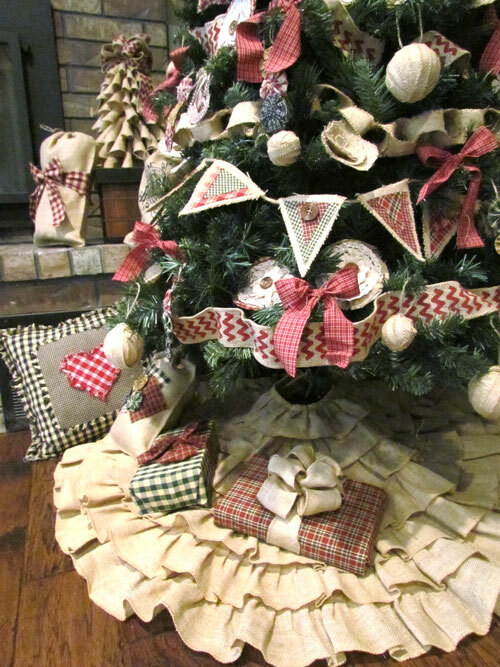 The red bows covering the tree were made from our 1.5″ Homespun Fabric Strips in the Dark Red 2 fabric color option. The strips are 40″ long and come in a set of 12. We cut them to 20″ before tying the bows so we got 24 bows from one pack of strips. 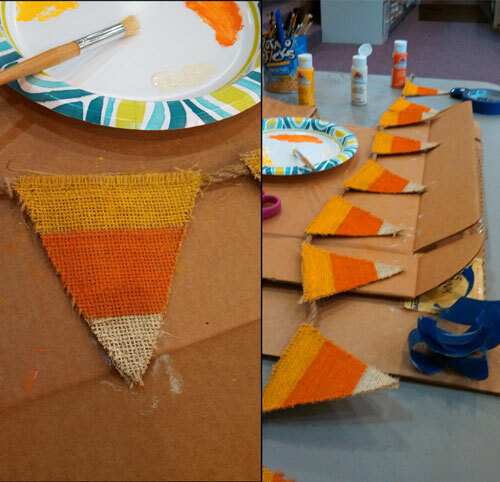 My daughter Sara used Christmas homespun scraps to add a fabric embellishment to a couple of our Burlap Triangle Flag Banners. These banners are typically used over fireplaces or over window but they looked ADORABLE on this tree as an unique decor element. Finally, we filled in all the gaps with these soft, feminine burlap and homespun fabric flowers and a generous helping of large and small size Burlap Ball Ornaments. The finishing touch was few quilted homespun ornaments that were handmade by my mom. 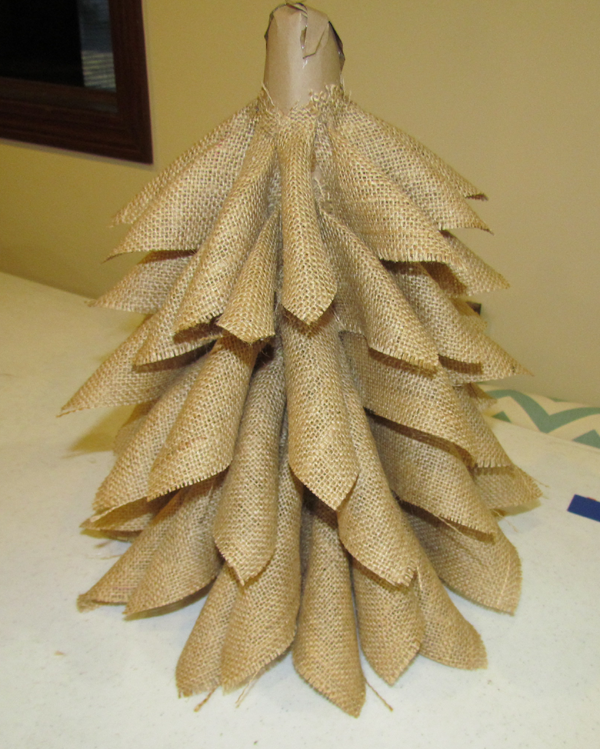 This Ruffled Burlap Tree Skirt anchored our picture perfect Christmas tree with such burlap fluffiness! Designed to go with the Ruffled Burlap Tree Skirt are some adorable Ruffled Burlap Stockings which will soon be hanging from my mantle. 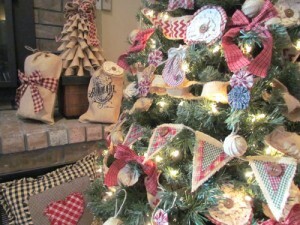 By the way… did you notice the homespun and burlap wrapped gifts under the tree? And the burlap drawstring gift bags? That’s a little preview of another blog that will be coming soon! I’m going to show you all the cute ways we found to wrap up your Christmas in burlap and homespun fabric. Stay tuned! 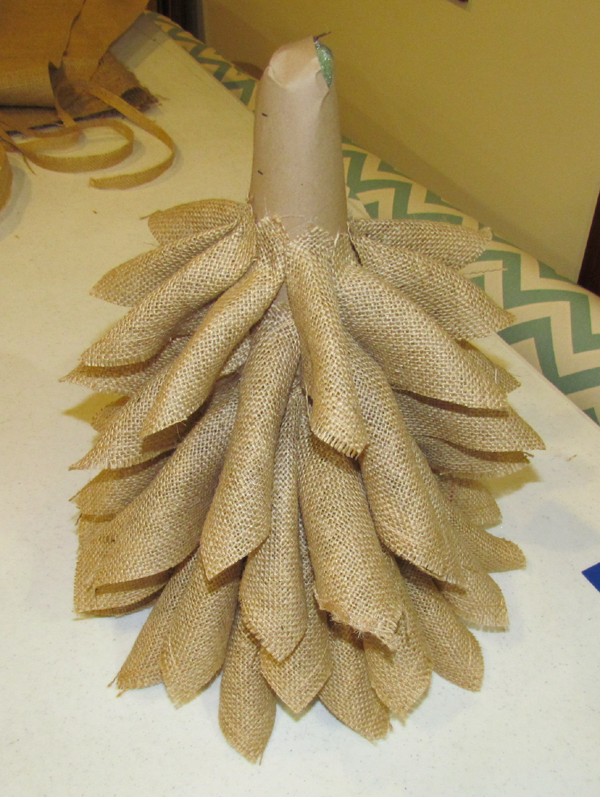 Did you think of some fun and creative ideas for burlap and homespun? We’d love to hear about it! Just leave us a comment with your idea or suggestion or even better, send us a picture of what you make! Be inspired! But as for me, I trust in You, O Lord, My times are in Your hand. Are you wanting to make an amazing new wreath for your home but don’t have much time for a big crafting project? 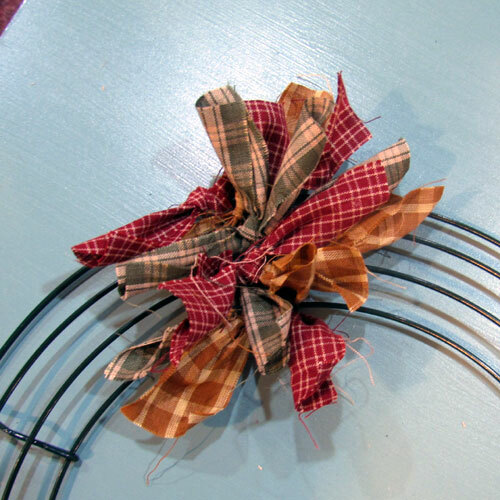 Then you will love this simple rag style wreath. We love the rag wreaths so much that we’re going crazy making different colors and styles! I’ve outline the basic steps below but before I get to that I want to show you some pictures of the wreaths that we’ve made this month. These wreaths were made using strips of homespun fabric. 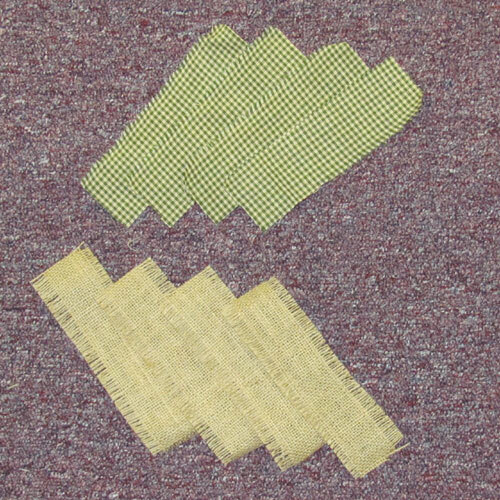 You can buy packs of strips or cut/tear them yourself. 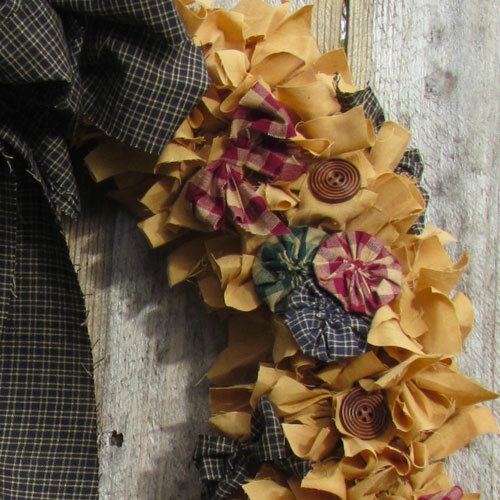 I’m hoping you will find something that will inspire you to create your own unique rag style wreath! 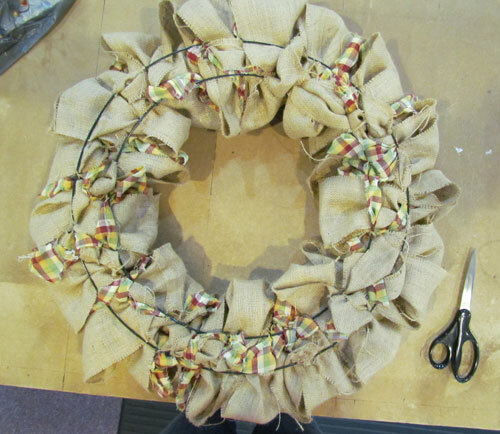 This wreath below was made using 6 packages of our 1.5″ precut Dark Tea Dye fabric strips cut into 6 inch strips. The bow was made with the 2.5″ Black fabric strips. We used colorful homespun fabric yoyos to decorate as well as wooden buttons and fabric scraps for bows. The wire frame form was the larger 18″ size and it required 5 packages of the Dark Tea Dye fabric strips to fill it out. 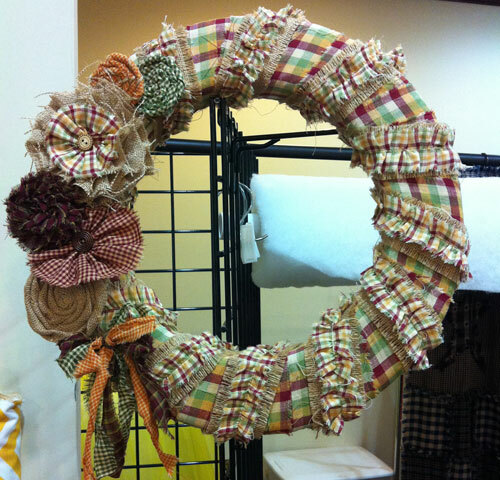 This wreath was the favorite of our studio assistant Anna and it will be adorning her home this fall! 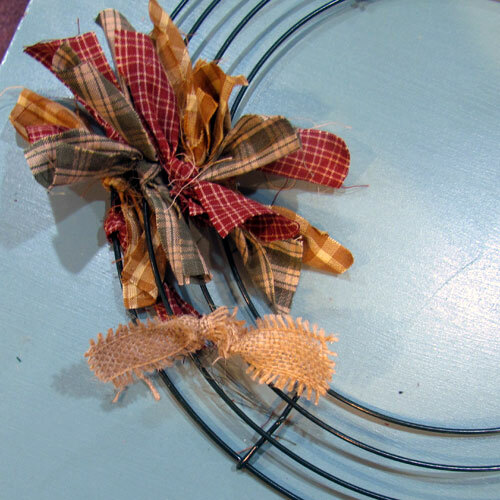 This warm and simple wreath was made with a smaller 12″ wire frame. 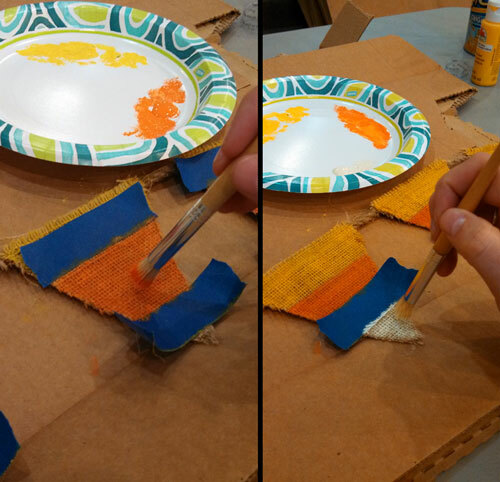 We used 3 packs of the 1.5″ homespun fabric strips in the Gold 5 color, cut into 6″ strips. The bow was made with some scrap homespun fabric, a stray fabric yoyo and a wooden button. 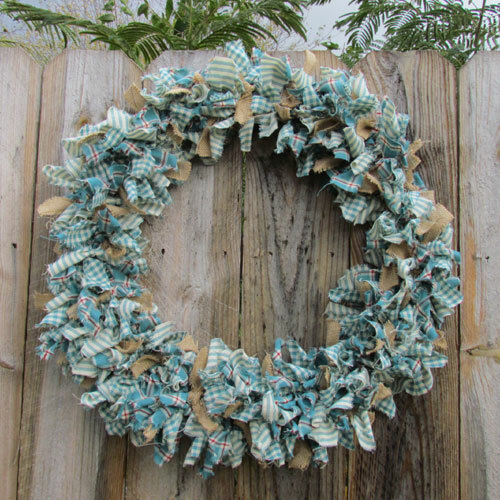 I love the simple, homestyle look of this rag wreath! This wreath will be finding its way into someone’s home in the next few weeks through our exciting giveaways! Check our Facebook business page often for giveaway announcements! This beautiful wreath is made from about three yards of our Ginger Blue homespun fabric collection with about eight of our 1″ Frayed Edge Burlap Ribbon mixed in. 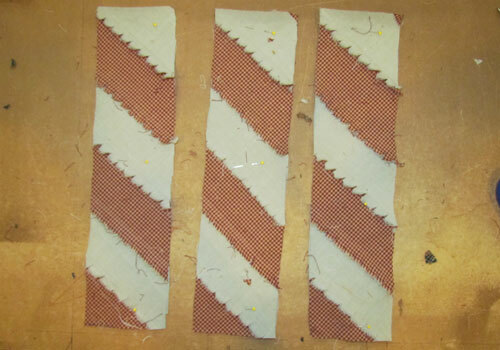 These fabric strips were torn about 1.25″ wide and then cut 7 inches long. The fabrics and the burlap make such a lovely, seaside-like combination that we didn’t add any embellishments to this design. I plan to enjoy this wreath year ’round in my guest room which has a matching quilt cover! Are you hooked yet? This last wreath is made with three different colors of our 1.5″ Homespun Fabric Strips and 3 rolls of the 1″ Frayed Edge Burlap Ribbon. 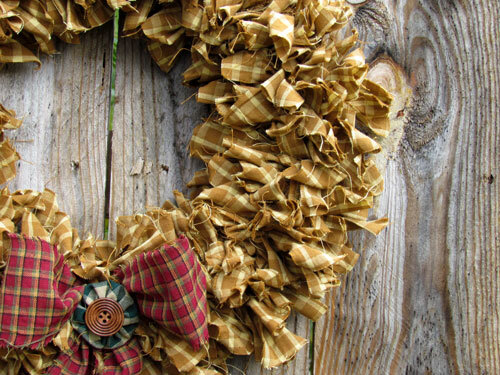 The mix of these warm colors give this wreath a soft homey appearance. It works perfectly with many holiday decor themes or could easily be used all year long with similar decor colors. This is the wreath that I photographed my steps with so follow along below as I show you how simple a Rag Wreath project can be! Cut your fabric strips and burlap ribbon into 6″ strips. Begin tying the strips onto the wire frame. Fill up one “section” at a time and mingle the burlap in just occasionally. 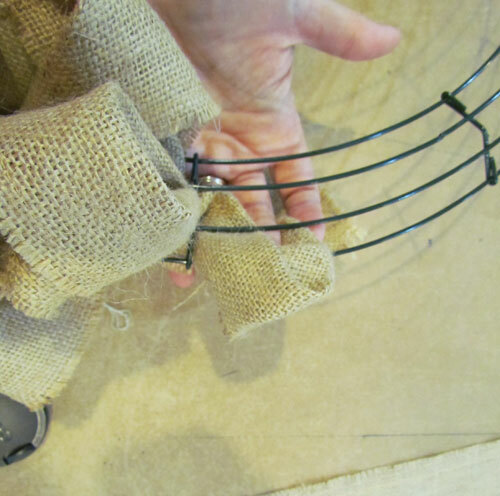 When adding the burlap ribbon, pinch the ribbon in half at the point that it wraps the wire. This will help you get a tighter knot with the stiff burlap. The wire frame is usually separated into six “sections”. Fill each section loosely. Once you have all the sections loosely filled, then go back and add the remaining strips. This will help you evenly distribute the fabric. When finished, the back of your wreath should show the knots, like the picture below, and the front should be full and fluffy. Now for the fun part! Embellish and decorate your wreath as you so desire. … or just use it as it is! Either way can be beautiful. We used our 2″ Wired Edge Burlap Ribbon to shape a nice full bow on this wreath but you should definitely put your own personal spin on the embellishments. Now go hang it on your door and let your neighbors and friends be amazed at your own unique handmade creation! Don’t forget to watch our Facebook page for giveaway announcements. We’ll be giving away this multi-color wreath and the gold wreath sometime in the next few weeks. Be inspired! 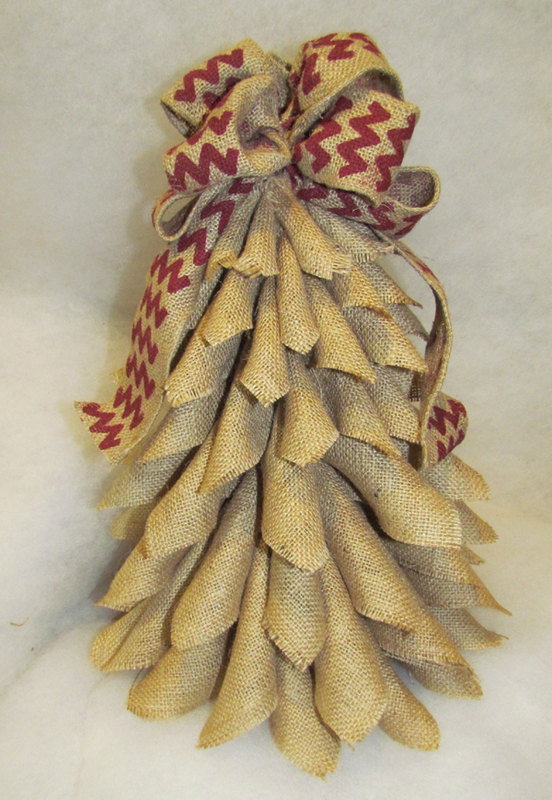 Cutest Little Burlap Christmas Tree EVER! Break out the Christmas crafts! If you’re going to have them ready for the holidays, you need to start early. At least, that’s my excuse anyway. Honestly, I could probably be happy doing Christmas crafts all year long. 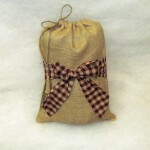 Especially this year since we’ve added a lot of new burlap products and materials to our inventory. 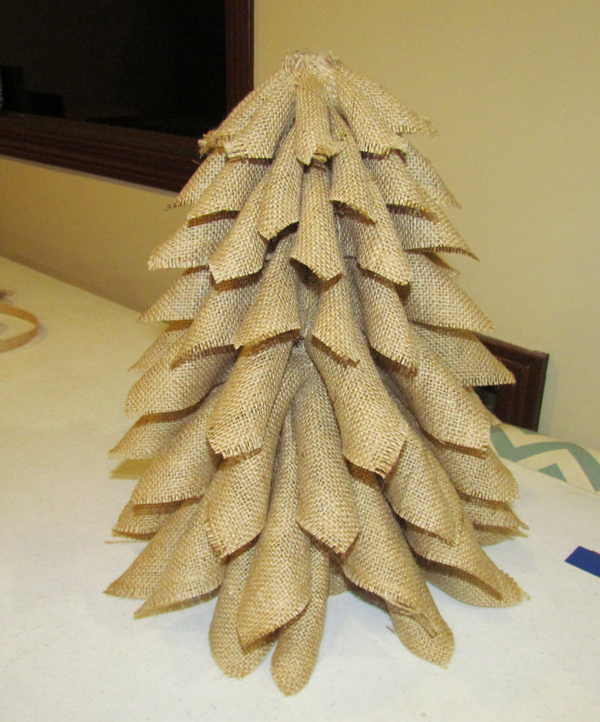 So, as my first Christmas craft of the season, I present to you the Cutest Little Burlap Christmas Tree EVER! I saw a similar tree for sale at a market and knew I’d just have to try making one. It was actually much easier than I had anticipated. I took pics along the way and I’ve written some brief overview instructions below. This basic concept could be adapted several different ways depending on your personal taste. If you make one of these, send us a picture! We’d love to show some of them on our Jubilee Fabric facebook page. You’ll need a basic styrofoam cone shape as the base. If you want to be creative, you can use just about any cone shape. This will dictate the size of your tree. The cone I used was about 12″ tall. 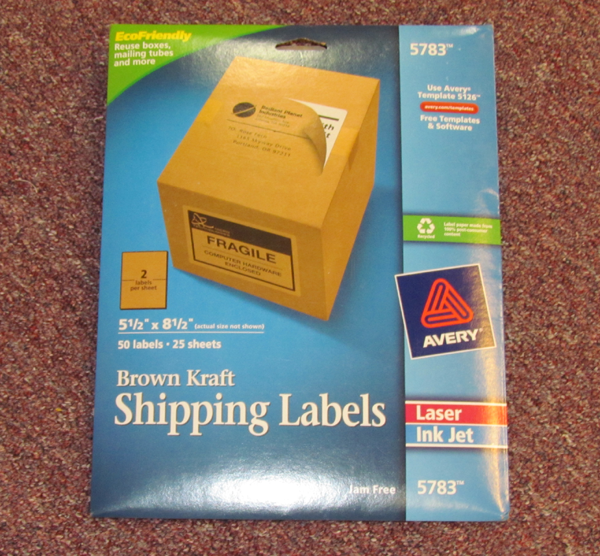 A couple sheets of kraft label paper. 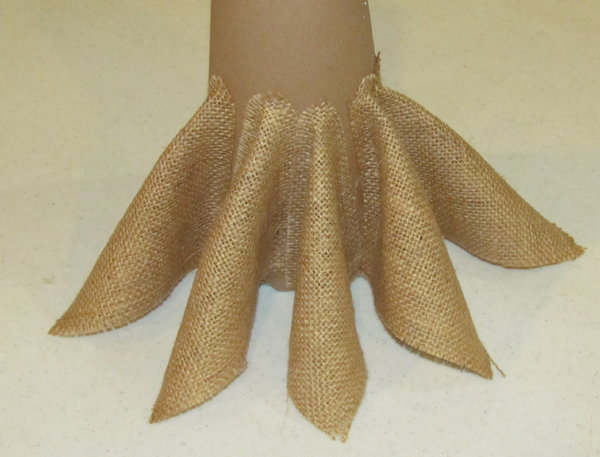 This will be used to cover the cone and make a background for the burlap folds. 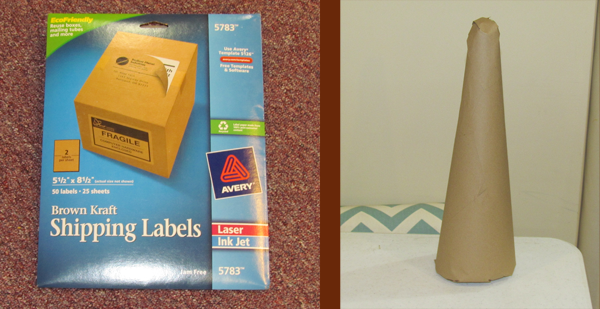 If you don’t want to buy the label paper, you can just glue any kraft paper to your cone. 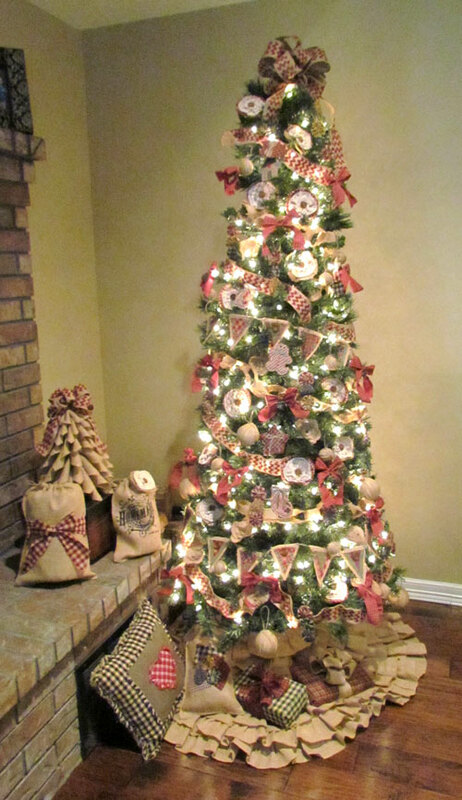 Burlap: It’s hard to say how much because the bigger your tree, the more burlap you’ll need. For this size, I used about four rolls of our 4 inch wide frayed burlap ribbon. Topper: Use your imagination! This 2″ wire edged red chevron ribbon was perfect for my design. This bow was made from one roll. Glue gun and glue. … lots of it! Cover your cone with the kraft label paper or otherwise glue kraft paper onto the cone. Cut about twenty 4 inch wide squares from the burlap. 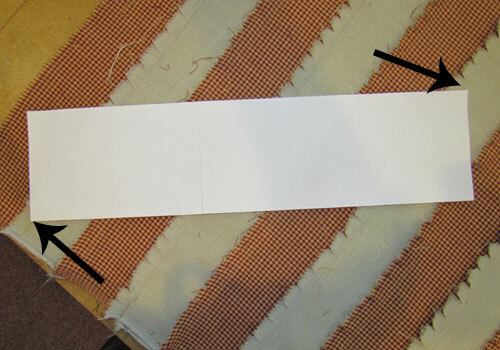 Fold them together matching 2 opposite corners and put a dab of glue to hold the corners together. 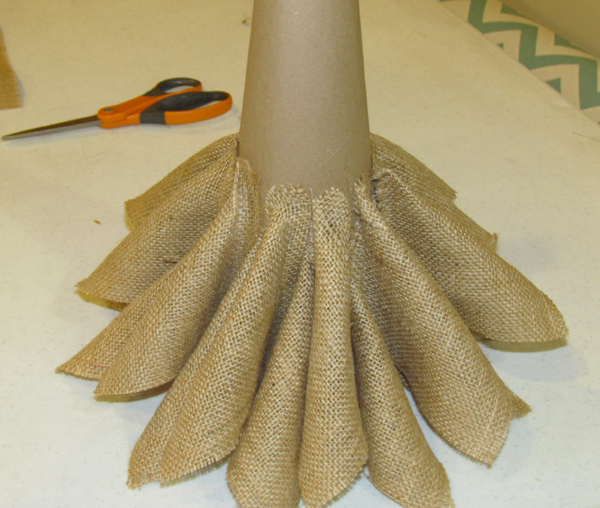 Now glue one of the burlap folds onto your cone as shown in the image below. Make sure the bottom of the fold lightly touches the table. Glue the top of the fold securely to the cone. Then just tack the bottom of the cone with just a dab of glue. You basically just want to keep it lined up nicely in place. Make sure you don’t glue any of this bottom row to the table! Keep adding more folds until you go all the way around the base of the cone. Now add a second row just about 1″ above the first. Squeeze a new fold in between the existing folds of the first row. Again, attache them securely at the top but just tack them in place at the bottom to keep them from sticking out awkwardly. 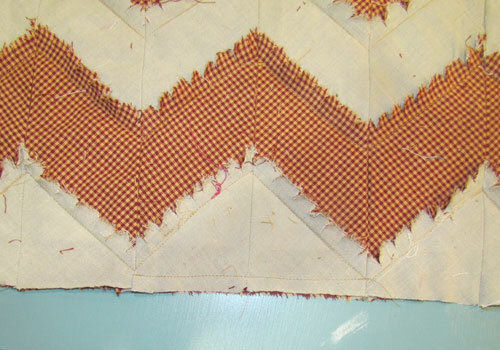 Depending on the size of your cone, you may need to make a few more 4″ squares to complete these two rows. I basically just made up the squares as I needed them since it’s kind of hard to predict. 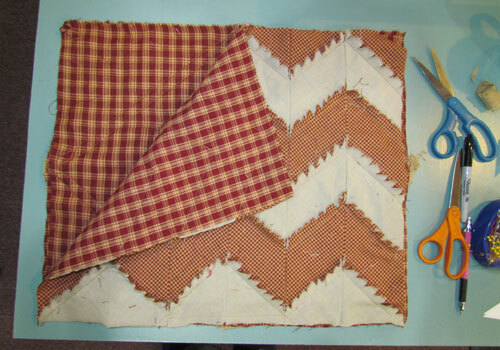 Now cut some 3.5 inch squares and repeat steps 3 – 5 to create two more rows of folds made with the 3.5 inch squares. Even smaller now… cut some 3 inch squares and make two more rows. If your cone is much taller than mine, you may want to make three rows instead of two. One more time… cut 2.5 inch squares and finish off the last couple rows with these small ones. Now pull out any burlap “strings” that are coming loose from the sides. You may have to clip them with the scissors to get them out if they have been caught in the glue. 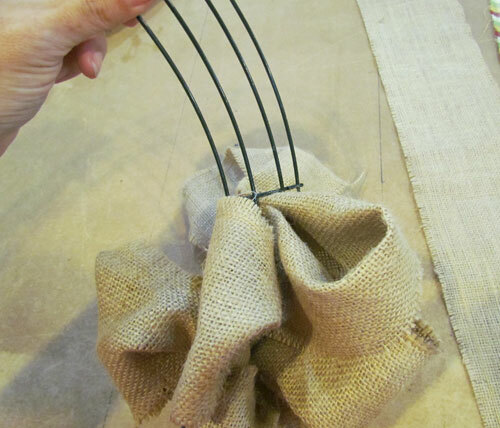 Pull loose strings as much or as little as you want to create a slight fraying on the edges of the burlap. Top the tree with your embellishment of choice. I made a bow out of a single roll of our Red Chevron Wire Edge burlap ribbon which will coordinate nicely with some other Christmas projects I have planned. But I also experimented with several different toppers which I photographed to show you. I think this project probably took me just about an hour to finish. I’ve already received lots of compliments on my little tree and I’ve been so pleased with it. So throw on some Christmas music, break out the hot cider and make a burlap Christmas tree for your home! Happy Christmas crafting, everyone! I absolutely LOVE decorating for the holidays! Every year as I start digging out my holiday decor I feel like I’m seeing old friends that I haven’t seen in a year. How we decorate our homes is such an important element in all our various holiday traditions. In honor of home and family, our next few blogs will be featuring some fun, simple homespun and burlap holiday craft ideas. 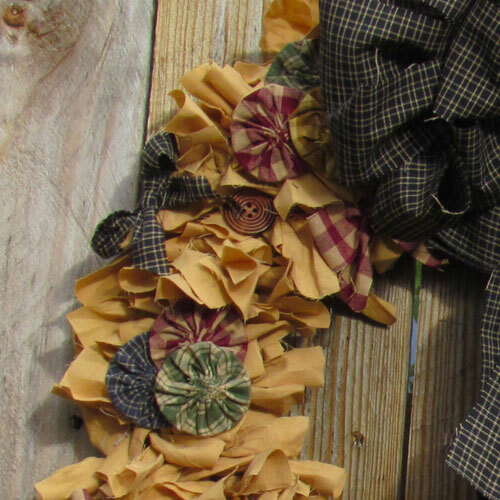 Today I’m going to show you two completely different fall color wreaths that I made using our Nantucket homespun fabric and our frayed edge burlap ribbon. This wreath is SUPER easy, SUPER fast and SUPER cute! First you will want to unroll your burlap and press it lightly with an iron to straighten it out flat. 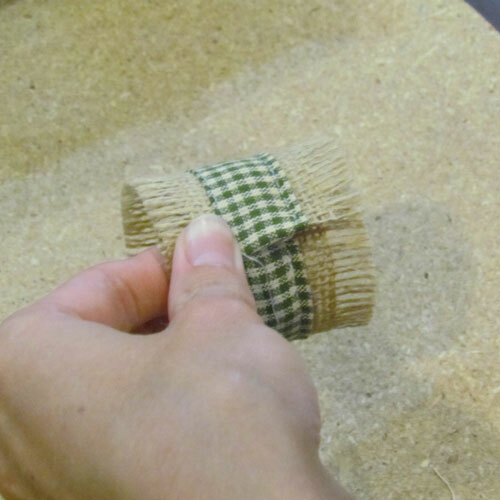 Now use the glue gun to attach all the rolls, end to end so that you have one long strip of burlap. Tear one strip of fabric 4 inch wide. Tear from selvage to selvage. 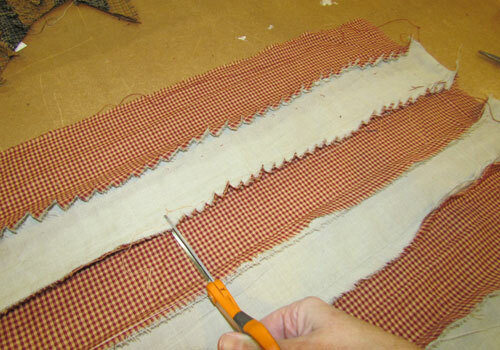 Now tear the rest of the fabric into strips that are approximately 2 inches wide. 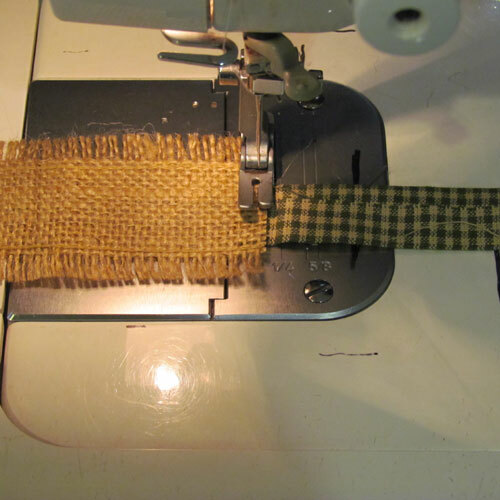 Connect your 2 inch homespun fabric strips the same way as the burlap, end to end, so that you have one long fabric strip. Save the 4 inch wide strip for a bow to embellish with when you are done. 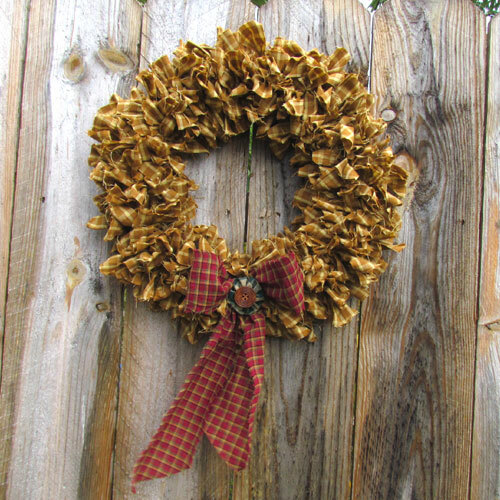 Fold one end of the burlap strip over a section of wire in your wreath and glue it so that the end is securely attached to the wreath. Do the same with the 2 inch wide fabric strip. Now begin pulling the burlap through the spaces between the wires of the wreath. Don’t pull it all the way through but just a few inches to make a “loop” on the front side. Then pull it again through another segment of wire. Alternate back and forth randomly between the three open sections formed by the wires. 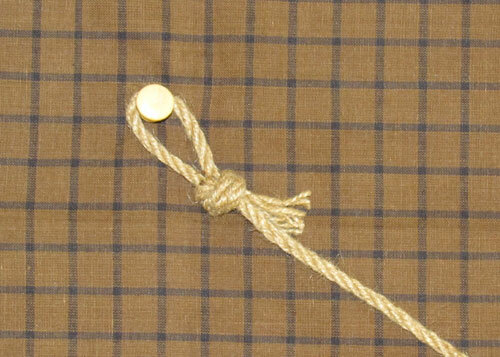 Pull the burlap up close on the back side but loop it generously on the front side. Be careful not to pull hard or you will pull out the previous loop. If this is causing a problem for you, use the glue gun to secure those loops occasionally. Twisting the burlap once on the back side helps keep the loops fluffy and full. Mingle in some fabric “loops” in the same way. You can actually use as much or as little fabric as you want here depending on your taste. 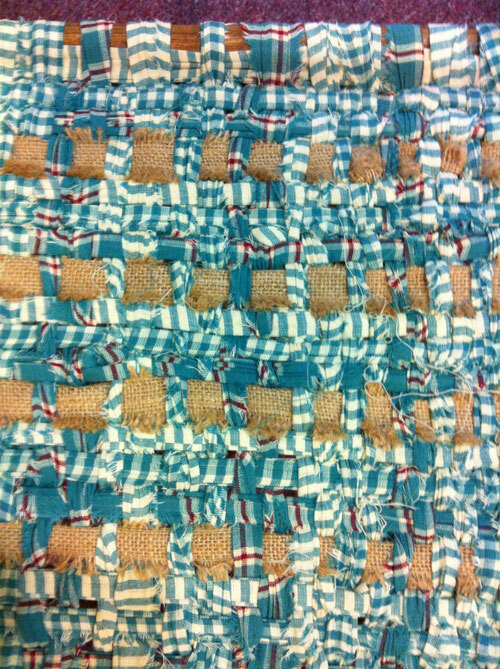 In our sample shown here, I actually just used about 1 loop of fabric for every 3-4 burlap loops. Keep pushing your loops towards each other as you work your way around the wreath. Because this burlap ribbon will fluff out nicely, it’s not necessary to fill it in real tight. When you are happy with the amount of burlap and homespun that you have on the wreath, just trim the ends of the burlap and homespun strips and secure in place on the back side with the glue gun. Shown below is what the wreath looks like from the back side when you are finished. If you like simple and basic, you may want to just use this wreath as it is now. Or if you prefer, some embellishments can be added. Of course, the natural looking burlap and warm fall colors are the perfect backdrop for just about any kind of fall or nature themed embellishments so you can really just use your own creative ideas at this point. 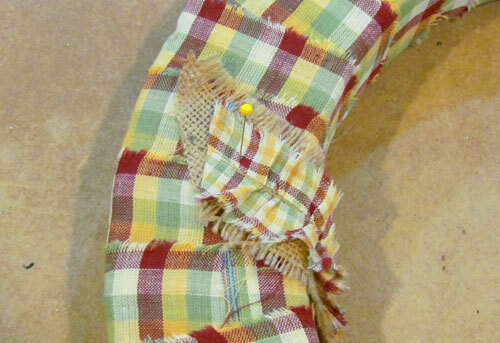 We chose to add a wide bow made from the same homespun fabric with a large wood button in the center. 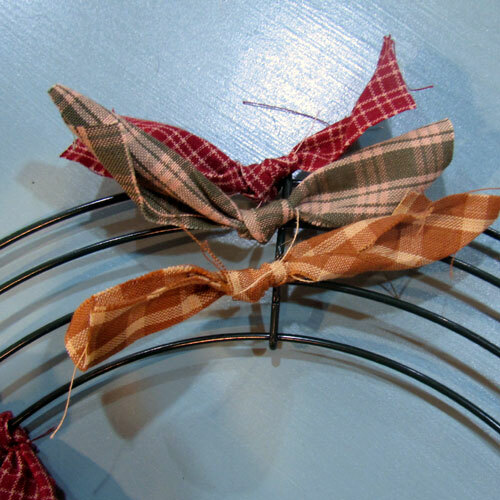 We also used a left over piece of our 2″ frayed burlap ribbon to create a bow. 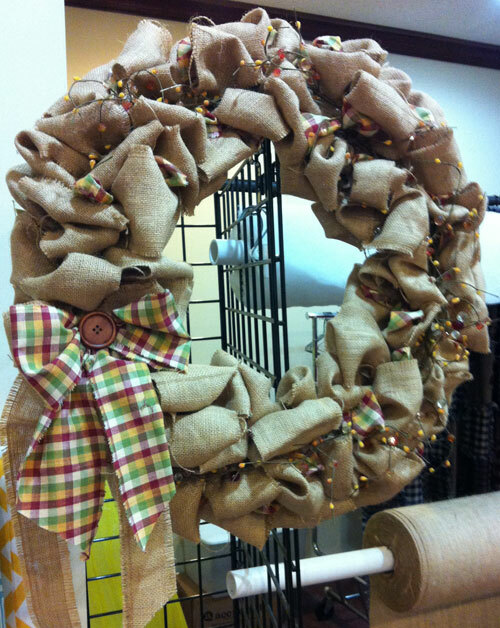 We glued the fabric bow over the top of the burlap bow and glued them both to the wreath. We also tucked in a wired, beaded garland element that adds a nice accent. Because this garland was wired, we just secured it in a couple of places and then tucked it into the wreath. The wire keeps it in place very nicely and if we ever want to change up the wreath, the garland will be easy to remove. And there you have it! 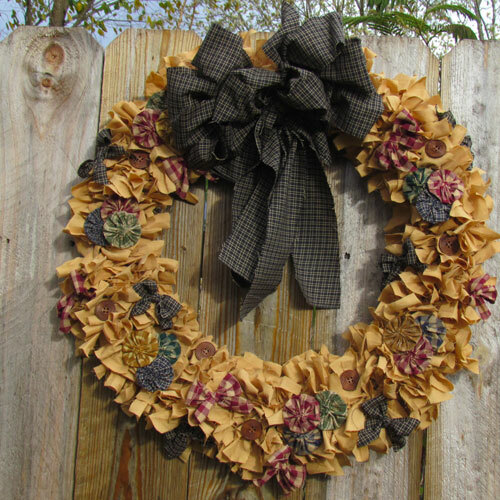 A quick, easy fall wreath featuring burlap and homespun fabric. 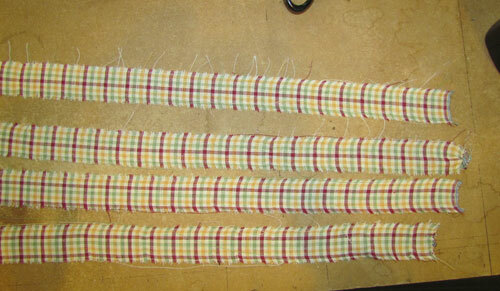 Tear the base fabric (Nantucket 4) into strips that are approximately 2 inches wide. Tear selvage to selvage. 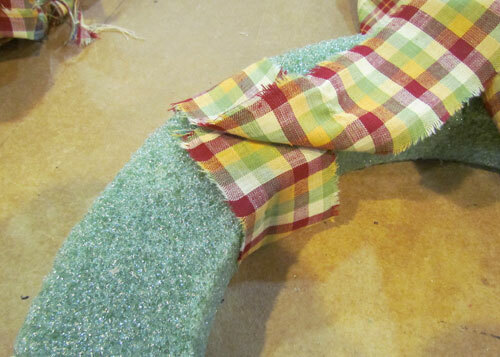 Wrap the fabric around the styrofoam wreath and glue it to it’s self to secure in place. Now continue wrapping the fabric strips around the wreath until it’s completely covered. When you reach the end of one strip, trim it off on the back side and glue the beginning of the next strip to it. When the wreath is fully covered, trim the remaining excess fabric from the back side and use the glue gun to glue the end to the fabric on the back of the wreath. 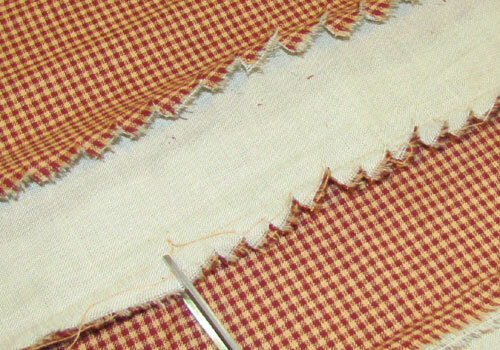 Tear the ruffle fabric (Nantucket 3) fabric into four strips 1.5 inches wide. Tear selvage to selvage. 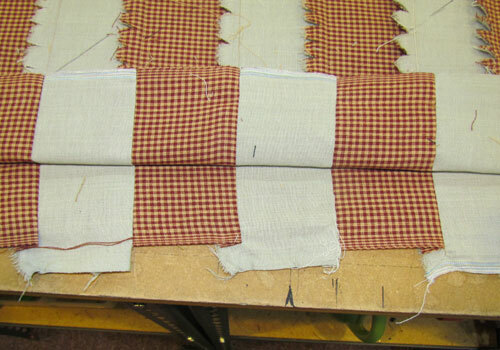 Trim off the selvage edges and stitch them together end to end to form one long strip. Now stitch lengthwise down the center of this strip with a long running stitch. 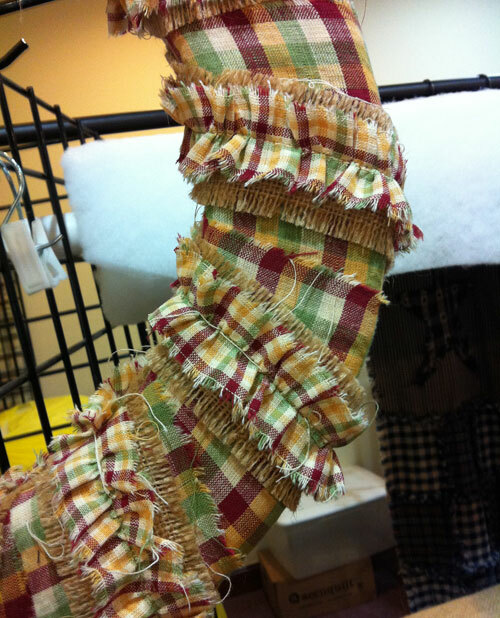 Pull the stitching thread from the back side to make this strip “ruffle”. Spread out the ruffle evenly. 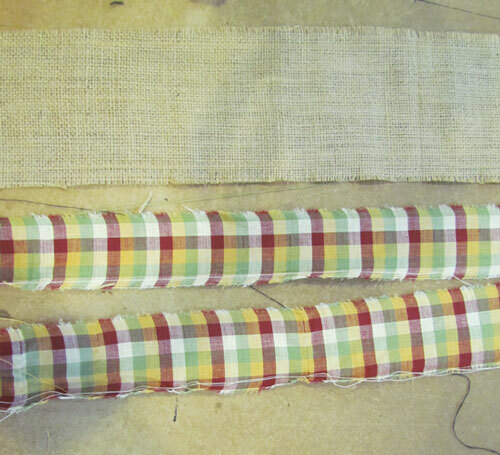 Lightly press the two burlap strips with an iron to make them lie flat. Stitch them together, end to end. 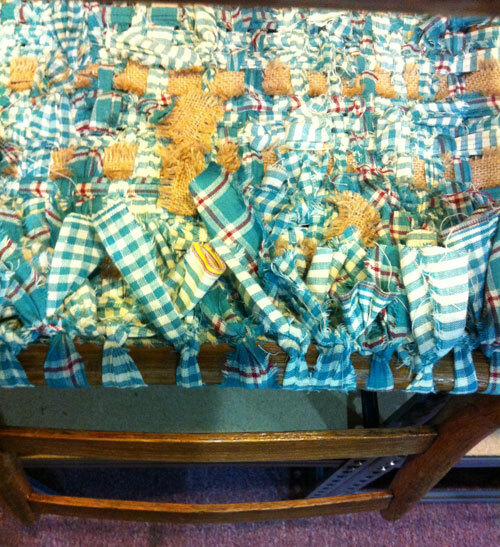 Pin the ruffled fabric onto the center of the burlap strip and stitch the full length down the center. Tighten or loosen the fabric gathering as needed to make it fit onto the burlap. 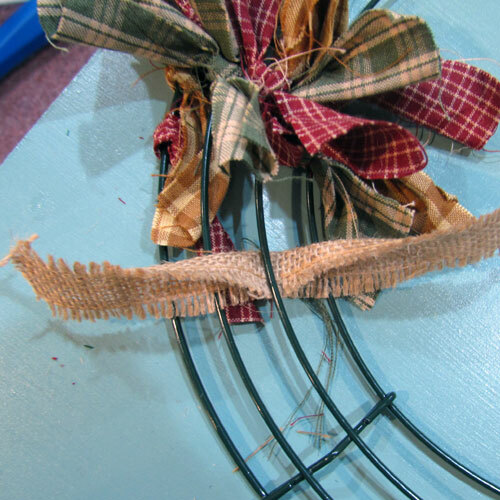 Now using a straight pin, pin one end of the burlap/ruffle onto the back of the wreath. (In the pic below, my pin is sticking up half way but push the pin fully down onto the wreath) Wrap the burlap/ruffle around the wreath until you are satisfied with the look. Trim the excess and pin again to secure in place. You can either wrap this in the same direction as your base cover or in the opposite. Either way will look nice. The reason for using straight pins at this point instead of the glue gun is that you can easily disassemble this wreath later on if you wish and use the embellishments on a different project. This is how the wrapped burlap/ruffle looks from the front when it’s finished. Don’t worry about strings from the torn edges. They just add to the primitive style but if strings are excessive, you can certainly trim them if you wish. 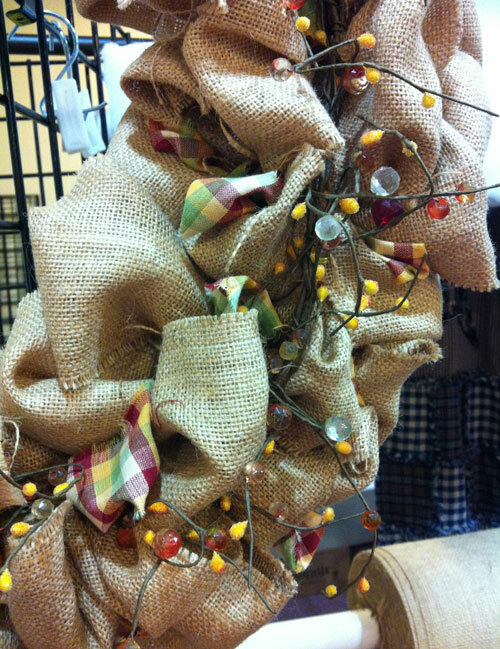 As with the Puffy Burlap Wreath, this wreath also looks great just as is for a simple fall decor element. However, it’s also a perfect canvas for all your creativity if you wish! We made some fabric/burlap flowers and tied a simple bow of assorted homespun fabric strips to finish this wreath off. We are crazy about hand made wreaths and we are working on two or three more in the studio right now. Look for a blog about those to be coming soon. The word in the studio is that we will be giving away several of our homespun and burlap wreaths to a few lucky winners so please keep a close eye on our Facebook page for giveaway announcements! 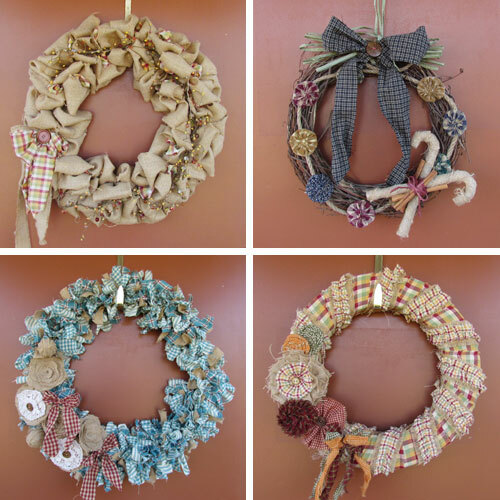 If anyone is inspired to try one of these wreath ideas, please send us a picture of your finished project. We love seeing what our customers are making and everyone who makes one of these will end up with their own unique creation. What will you create? Be inspired! Saturday was a beautiful, glorious autumn day in the Ozarks! The sky was blue and the temperature was in the 70′s. Our little town has a great farmer’s market located in the downtown park so after shopping for veggies we went browsing through our local downtown area which has several antique store and flea markets. 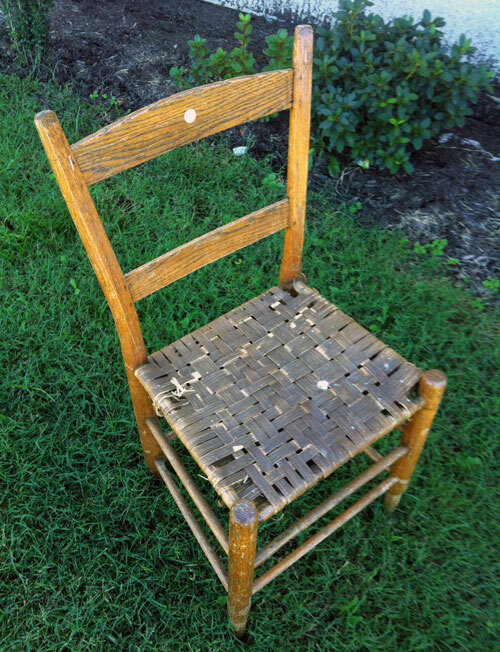 I found a primitive style woven cane bottom chair for $20. The great price tempted me to try something that I’d seen once with woven fabric. I was SO pleased with the results that the chair is now featured on my front entry with a few seasonal decorations. 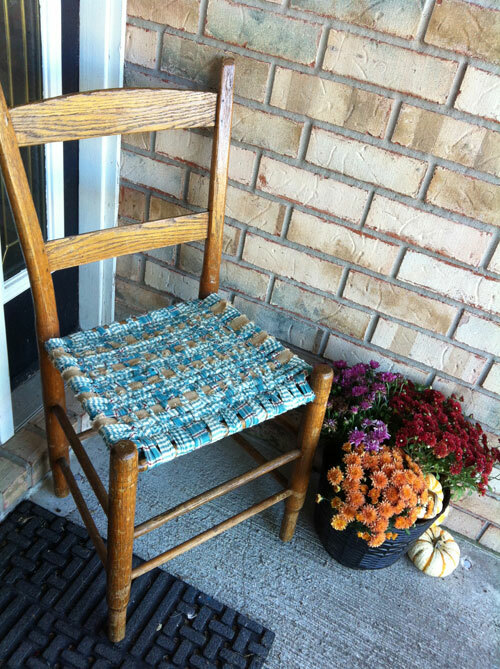 The fabric woven seat is very sturdy and I believe this would hold up to regular use. The fabrics used are actually the same fabrics that I have on a quilt in our guest bedroom so I may be moving it in there eventually. 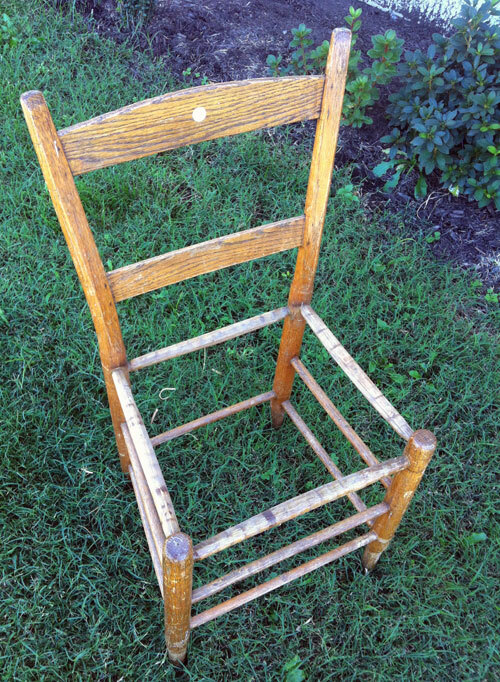 Materials needed for one average size chair are 3 yds homespun fabric, 4-6 yds 1″ burlap ribbon and a glue gun. This total project took me less than two hours and it really satisfied my “creative urge” on a beautiful Saturday! I’ve included some basic instructions and pics below. I really encourage anyone to try this and be creative with your colors and fabrics. This is how the chair looked when I brought it home. 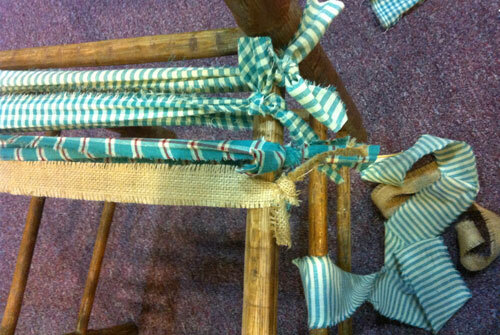 The woven cane bottom was cracked and breaking. It was very easy to take a razor knife and remove it entirely. 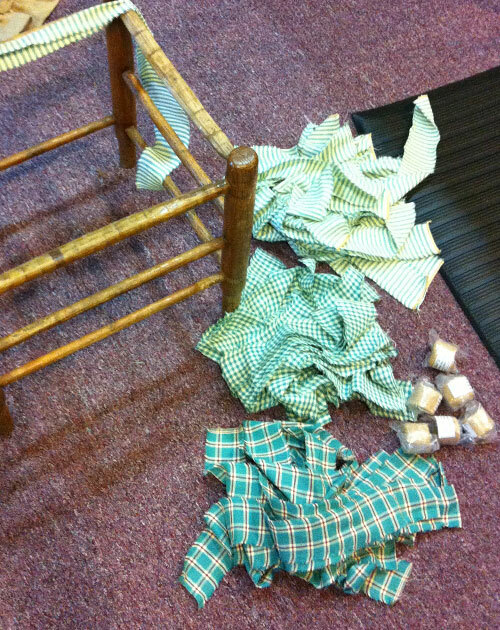 Then just a quick wipe down and the chair was ready for crafting. You’ll need approximately 3 yards of homespun fabric. It’s important to use homespun because homespun is the same on both sides. 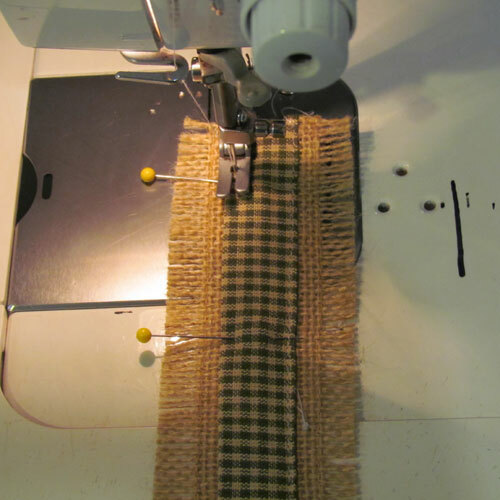 That way if your fabric gets turned while weaving, it doesn’t look bad.If you purchase burlap ribbon, make sure it is not wired ribbon and make sure the edges are stitched so it won’t fray while you work with it. For this project I used three different homespun fabrics and 2 rolls of 1″ burlap frayed edge ribbon. These particular homespun fabrics are called Ginger Blue and are in the Route 66 Collection at JubileeFabric.com. Tear or cut your fabric into 2.5″ x 44″ strips.If you tear it, pull out all the long loose strings that tend to cling to the torn edges. If you cut it, be sure to cut as close to the grain of the fabric as possible to reduce possible “shedding” of little threads. In this chair demonstrated here, I tore the strips. 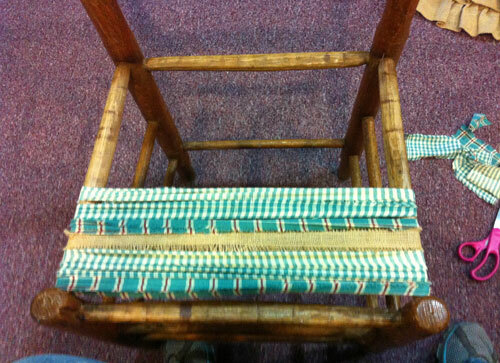 The actual number of strips you will use will vary according to the size of your chair and how tightly you weave. 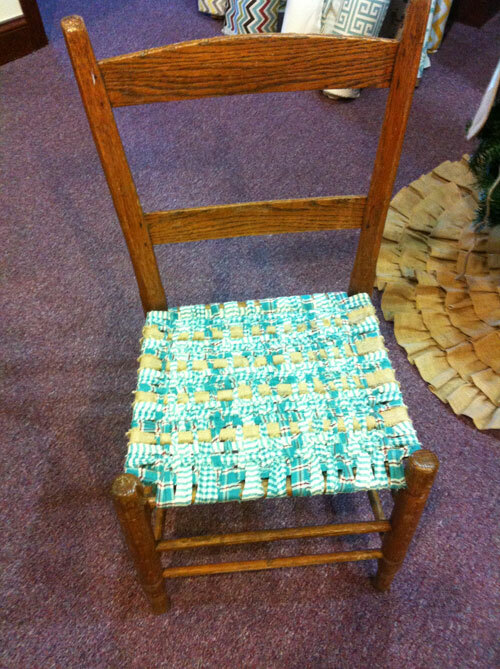 For this average size chair, I used 10 strips of each color fabric. 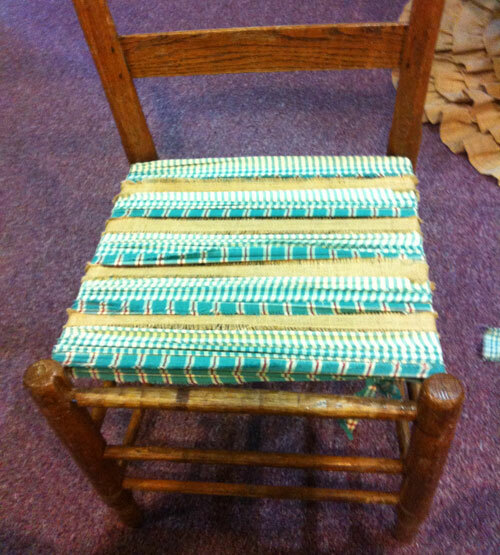 Fill the seat with fabric strips going side to side. 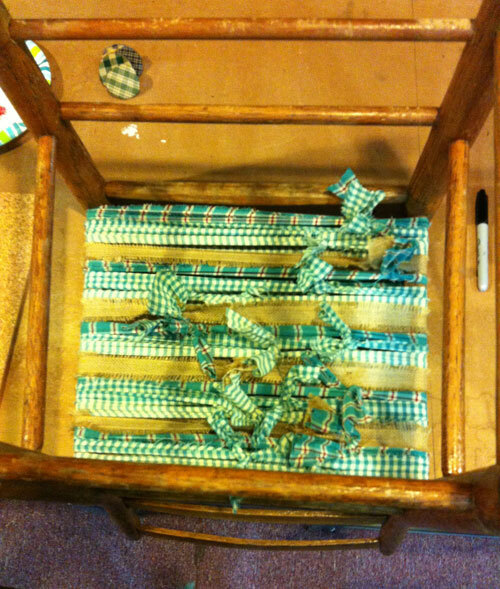 This is what the bottom of the chair looks like with all the crosswise strips in place and the knots rolled to the bottom. 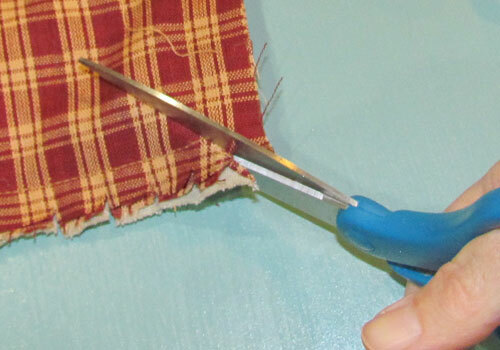 Trim off any long fabric tails to about 1-2 inches. Tip: If you have a burlap strip that is just a little bit too short, you can stitch some homespun fabric onto the ends of it to lengthen it. The knots will all be on the back side so this will never be visible and it will help you use all your burlap efficiently. You may not need to do this, it would just depend on the size of your chair. This is a great little sewing notion called a “bodkin”. It will clamp onto the end of fabric or elastic or whatever and give you something to grasp when pulling through. We bought this bodkin at our local craft store but if you don’t have a bodkin, you can use a really large safety pin instead. The bodkin will clamp onto the end of the fabric strip to help weave it through the crosswise strips. Now using the bodkin to pull with, weave the remaining strips of fabric from back to front and then to the back again using basic weaving (over/under) techniques. Leave about 5-6 inches loose at the back so that you can tie a knot when you weave back to the beginning again. Tie those knots as much to the under side as you can so that the knot and the tail will not be visible. 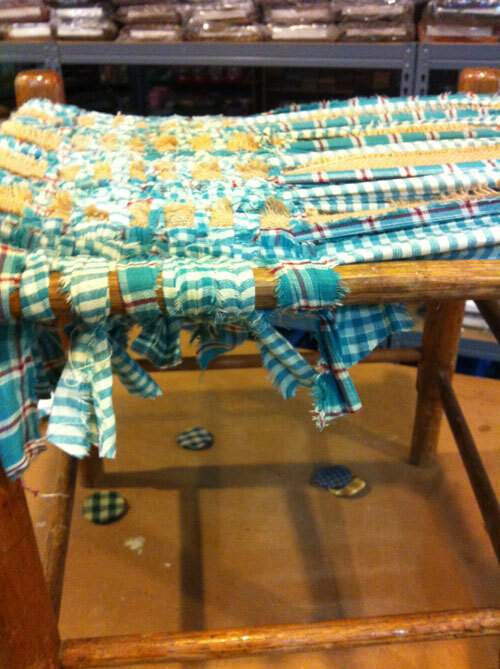 Weave in as many strips as you wish but try to make it fairly dense so it will be a sturdy seat. 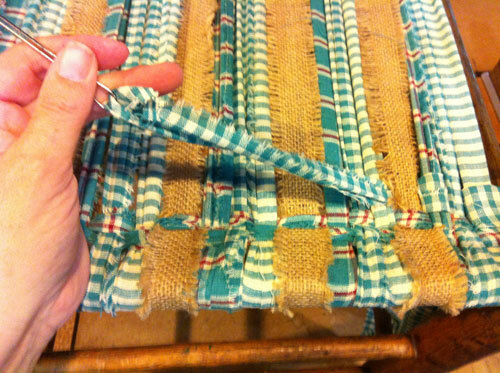 Now flip the chair over and trim off the tails of the knots at the back to about 2″. 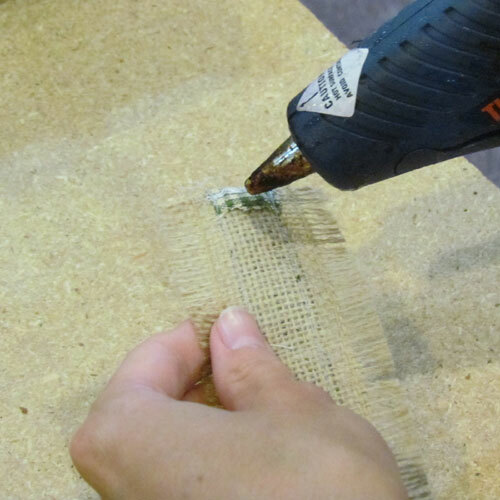 Use a hot glue gun to glue those tails down flat where they are not visible from the top. Also glue flat any tails that are remaining on the under side of the seat. 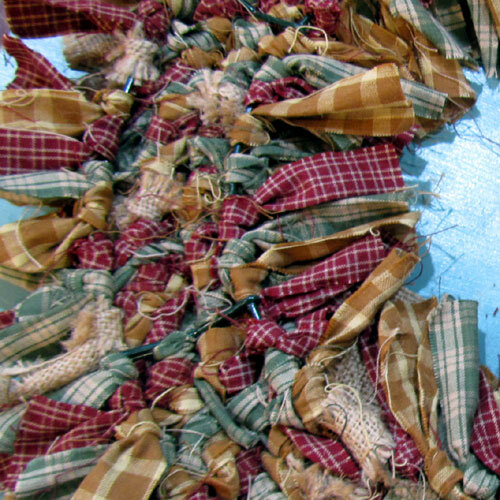 Many of those will have been pulled into the weaving and may not be visible anymore. Isn’t this just a sweet, cottage style accent for my front entry? I love the Ginger Blue mixed with the autumn color mums. Does this inspire you to try a little fabric weaving? I have to say that I have never, ever done ANY weaving at all so please don’t analyze my technique. I am definitely amateur but the results were good and the fun factor was over the top! I would love to hear about and see pictures of your fabric weaving projects. September is here and it’s beautiful as always! This is probably the very best time of year here in the South with warm days and cool evenings. We’ve had some fun here in the studio with our burlap products and I’m going to share a great fun and easy fall craft project using our mini triangle burlap shapes. These little burlap triangles come three in a pack for $2.50. For the busy crafter, we also offer a burlap banner with the triangles already stitched onto a chunky jute rope. 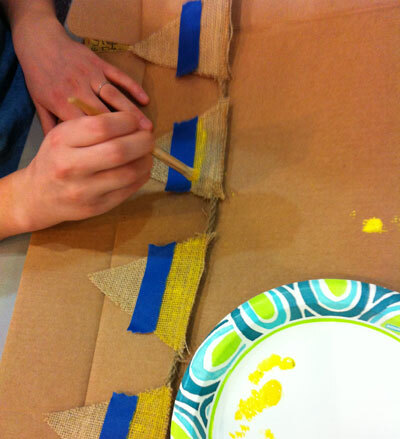 These burlap flags are great for stenciling letters to form words or adding cutout fabric or paper shapes. But in this case, their adorable little triangle shape was just begging for some yellow, orange and white paint. 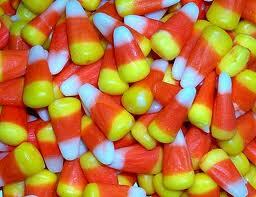 What could say “Fall fun” more than candy corn? So… we stitched nine of the little triangles onto a stretch of our jute rope spacing them about 1 inch apart. We tied a couple of loop knots on the ends to hang it with. Anna, one of our studio assistants, used a soft stencil brush to add craft paint to the burlap. She used painters tape to mark off the lines where the color would change. When stenciling with craft paint like this, you always want to make sure that you dab the brush enough to removed excess paint before applying it to the burlap. Remember that you can always add more paint if needed but it’s really hard to remove once it’s on there. 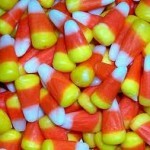 We were VERY pleased with the candy corn burlap banner when it was finished. 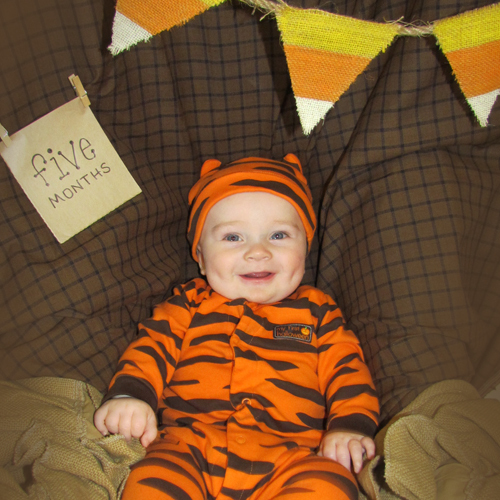 An unexpected benefit of this little project was that the banner made such a nice prop for photographing our favorite little Tiger. 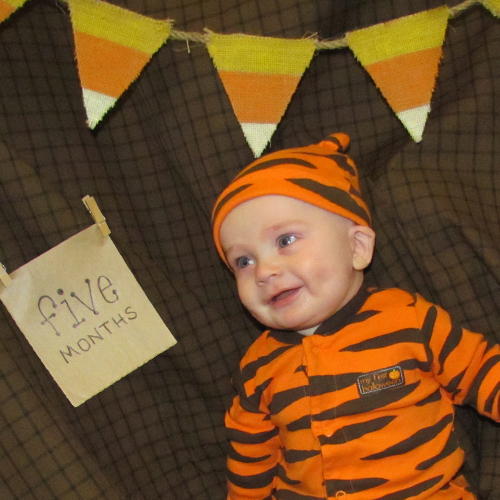 All dressed up and ready for fall festivities in his 5 month picture! Now that the photo shoot is over, I’m tempted to hang this adorable painted burlap banner on my fireplace but we’ve decided that it will be our next “giveaway”. Where would you use this banner in your house? 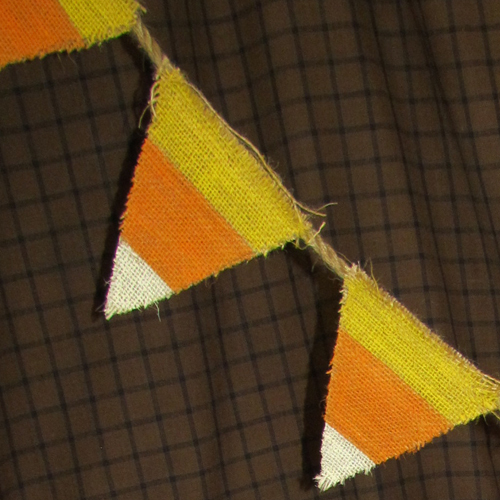 Watch our Facebook business page for a chance to enter a contest to win this candy corn burlap banner! The giveaway announcement will be soon. We are SO excited to have burlap products in the studio now! Burlap has such amazing texture and it compliments so many other craft materials. It’s stiff enough to hold it’s shape well, yet cooperative enough to be coaxed into just about any craft. Whether your passion is scrapbooking, home decor crafts, or wedding accessories, burlap just may be your new favorite element. 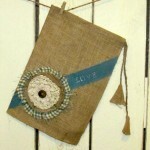 Visit our Pinterest board, Burlap Inspiration, to see some fun and crafty things other people are doing with burlap. The girls in the studio have been dreaming up fun projects of our own for the burlap so I’m sure this will be our first of many blogs about burlap. 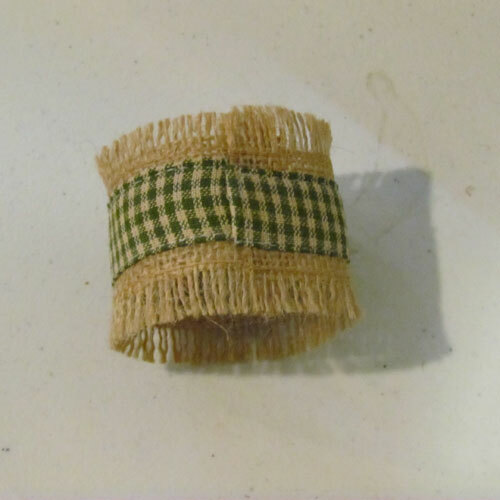 You will be amazed at how easy this Burlap ‘n Homespun Napkin Ring is to stitch up. All the materials are available from www.JubileeFabric.com. Happy Crafting! 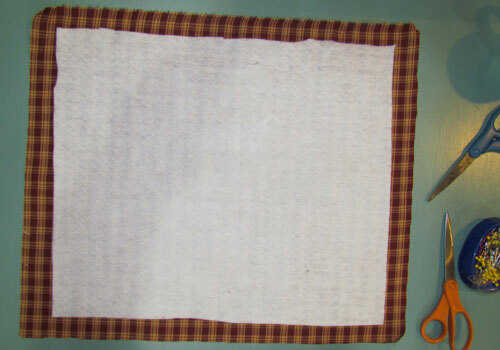 * These simple napkins are not lined so it’s important to use “homespun” fabric so that they look great on both sides. Homespun has no right or wrong side since the pattern is woven into the fabric rather than printed on the fabric. 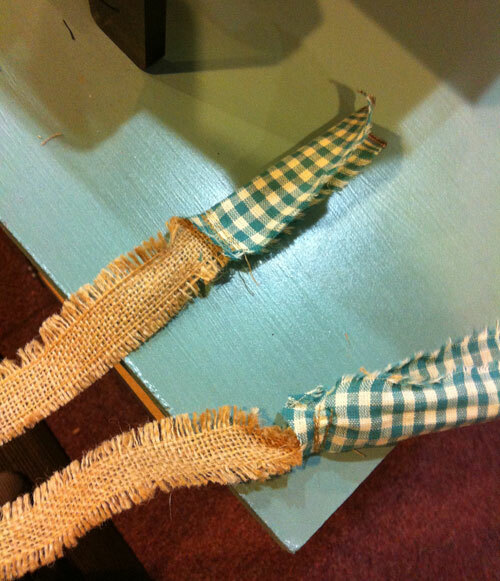 Cut 4 strips of the 2″ wide blank burlap ribbon approximately 6.5″ long. 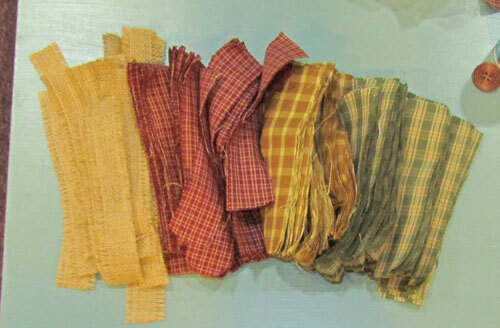 Cut 4 strips of the homespun remnant approximately 2″ wide and 7″ long. 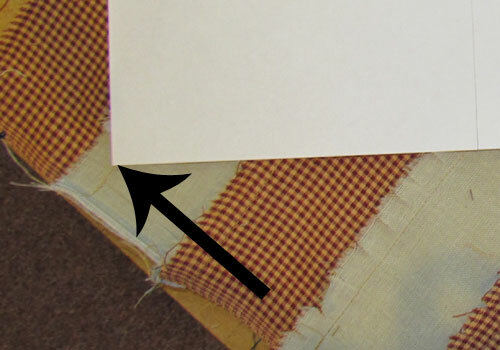 Fold in about 1/2″ on each long side of the homespun strips and press. 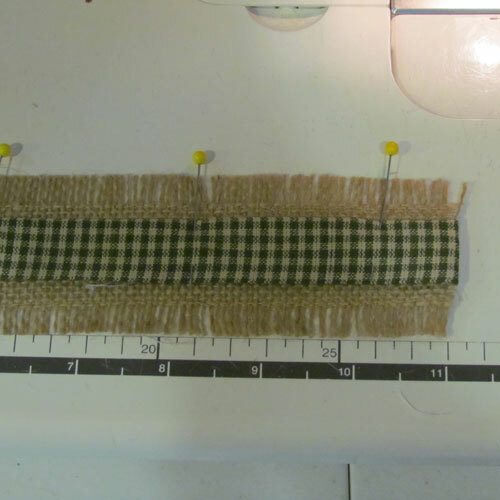 Place one fabric strip and one burlap strip end to end folded sides of the fabric strip facing up and the edges overlapped by about 1/2″. This is hard to describe but take a look at the pic. It’s easy to see. 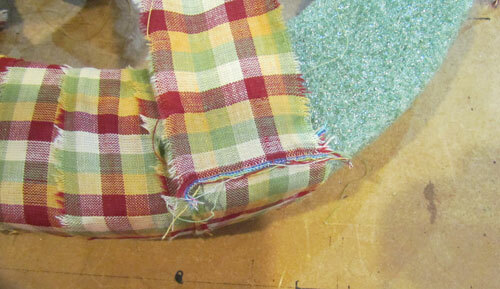 Now just stitch these two pieces together about 1/4″ from the raw edge of the burlap. 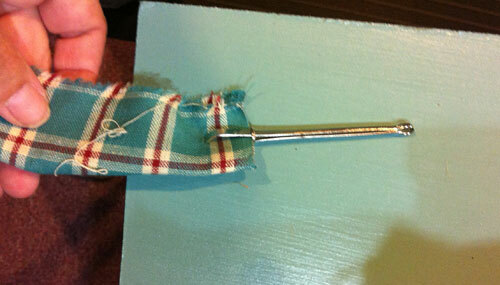 Lay the fabric strip back over the top of the burlap, press the stitched edge and pin in place. Be sure to center the fabric strip all the way. 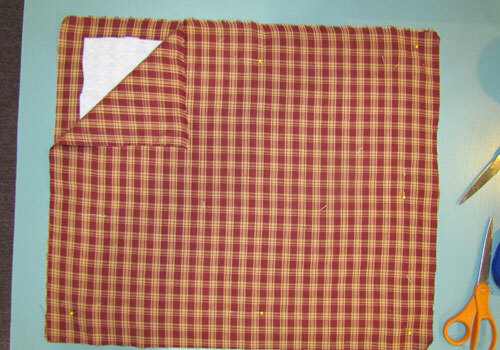 Now stitch along the long edge of both sides of the fabric beginning at the folded end and ending at the raw edge end. Put a thin line of hot glue on the BOTTOM side of the folded edge end. Loop up the raw edge end and place it under the finished edge to form a circle and hold in place until the glue sets. Your first napkin ring is finished! Repeat with the remaining pieces to make a total of 4 napkin rings. Embellishments such as a cute wooden button may be stitched on if you wish but these are also very cute just simple as they are. 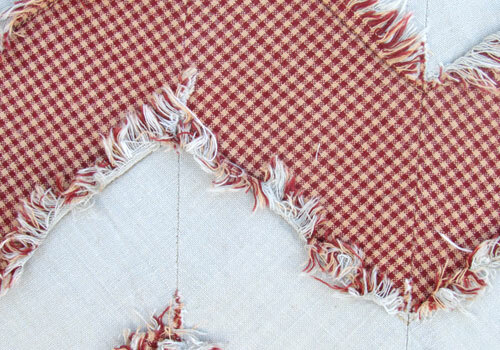 To make the coordinating napkins, just TEAR one yard of homespun fabric (44″ wide) into four equal parts. Don’t cut with your scissors, tear them and gently pull loose any strings that are falling out. Press the edges flat because the tearing will cause them to curl slightly. 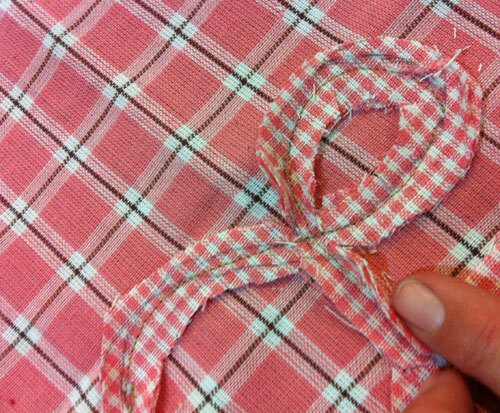 Stitch 1/4″ from the edge around the perimeter of each napkin to secure the edges and prevent unwanted fraying. 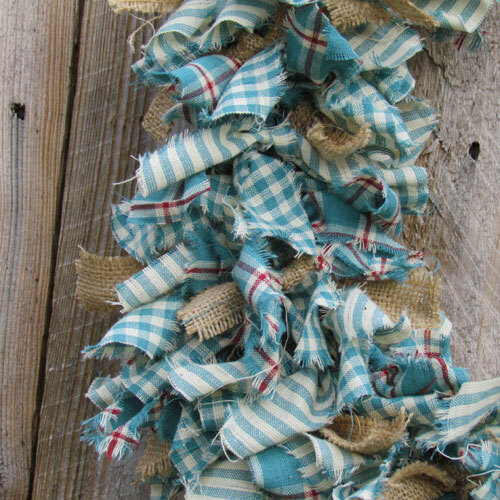 Each time you wash these, you may have a few more string to pull loose but that will stabilize eventually and the shabby edges look great with the burlap. 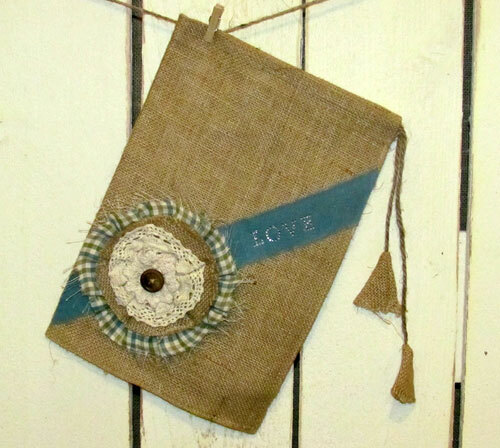 Do you think you’ll give this little burlap/homespun project a try? If you do, send us a picture! We’d love to share it on our Jubilee Fabric Facebook page. 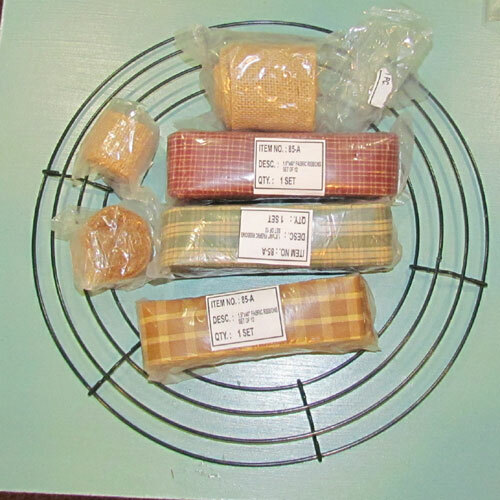 Sometime in the next month we will be giving away this same Garden Green set of 4 napkin rings and napkins. The giveaway details will be published on the Facebook page so be sure to “like” our page and visit it often.